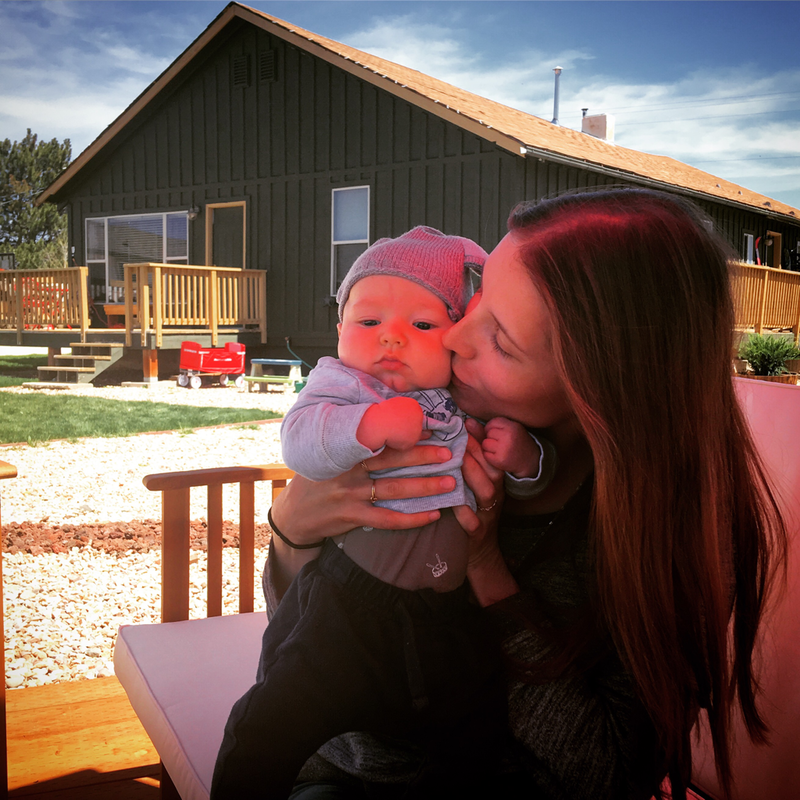 Well coda is already experiencing what it means to be the second child and is getting his first blog post at 3 months old. We can’t even remember what life was like before we had him... he makes our family complete! Coda, you are the happiest, most patient, sweetest, snuggliest, best sleeping little baby and we love you so much. The way he smiles and sticks out his tongue at us. The way he puts his arms above his head when he is sleeping. The way he holds his hands up in the air when he is sleeping. How does anyone sleep like this?! The way he puts a hand in front of his face when he hears his big brother. The way he stares at his black and white book during tummy time. The way he purses his lips when he is done nursing. The way he holds Jude’s hand when they tandem nurse. His huge smiles when daddy looks at him. The way he laughs when Jude laughs. The way he quietly and contentedly observes everything. ​His go with the flow personality. TWO YEARS!! For some reason this feels like a much bigger milestone than one year. We are amazed at how much Jude has learned and changed in the last two years and so proud of the hilarious, curious, adventurous, caring, loving little person he is. 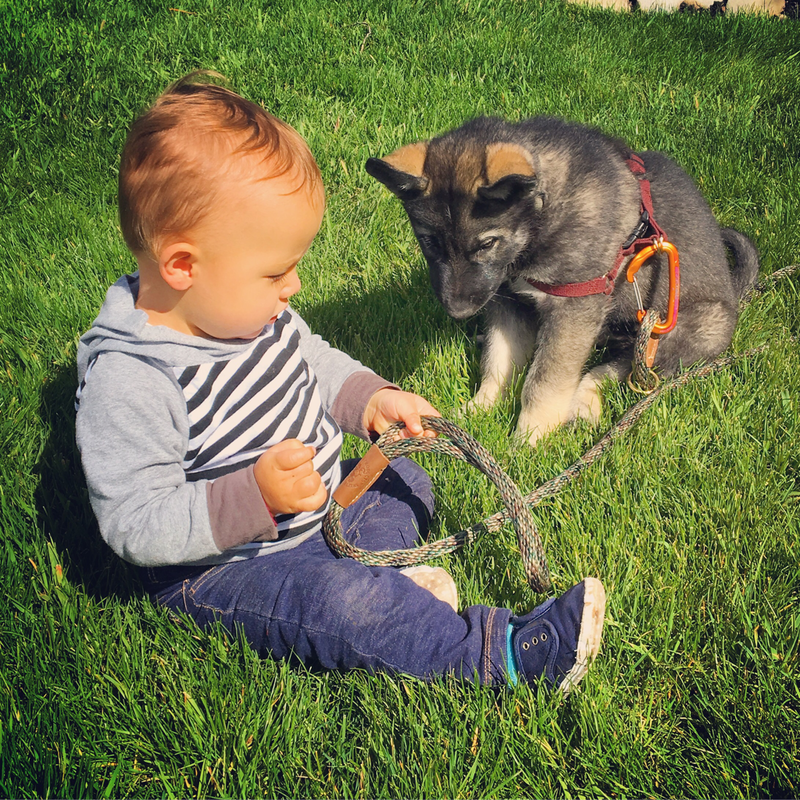 Health: Luckily we have had pretty good health since coda was born! One minor cold for Jude but that’s it. Sleep: one longer midday nap, sleeps through the night most nights usually 7:30-6:30. Diet: still nursing, still eats everything. Favorites include mango (maaaayo as he calls it), pokes (sweet potatoes), cheese, berries, granola, peas, hammy (ham), sausage, aaaa- sauce (applesauce), yogurt, chicken and Mexican food from the Mexican restaurant in kamas. It’s so fun to hear how he says the names of all the foods he loves! saying so many words! Starting to speak in sentences. He has been practicing playing independently every day and the other day played in his room alone for almost an hour! The way he pointed to coda’s eyes, hair, nose, etc. 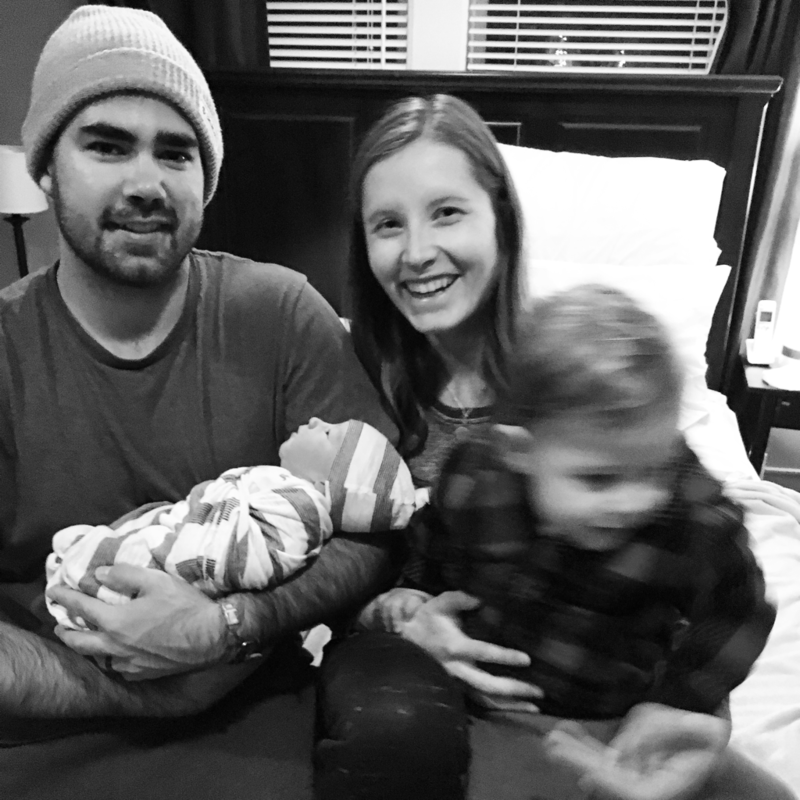 and then to his own when he came to the birth center to meet his baby brother. The way he says “hi doh!” And gives coda a kiss every morning. The way he tells mama when to leave at bedtime and waves goodbye. The way he pretends to waddle like a penguin. The way he dances when daddy plays the drums. The way he plays in his room by himself and practice singing and new words while he plays. The way he says “Haba bubba Jude!” And thinks that now every day is his birthday. The way he picked our birthday dinner menu (sausage, peas, sweet potatoes) without any prompting or suggestions. The way he requested painting with Otto and bubba for his birthday. The way he gives leg hugs. The way he runs away from dada and yells chase! The way he tells mama to pick up “doh” if I put coda down or let dada hold him for more than a few minutes. The way he puts his baby doll in coda’s bear suit and car seat as soon as I take coda out. The way he requests the more yoga song. The way he yells “yasss!” (Yes!) with a huge grin. ​The way he puts his arms around my neck or on my cheeks when we snuggle. The way he pretends to drive. The way he asks to call bubba, nana and tutu. He loves FaceTime and gets so excited when he sees their faces! The way he keeps telling everyone it’s his birthday (even over a week later). 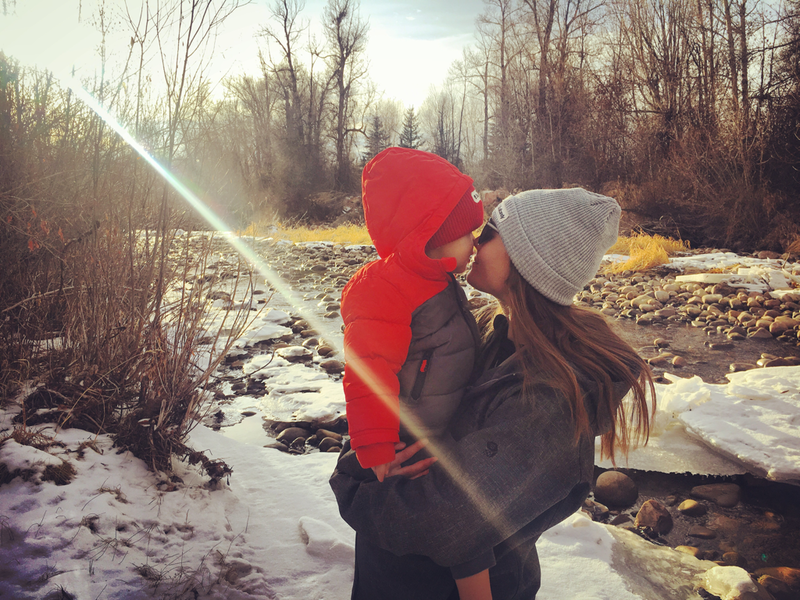 The way he gives dada kisses on the lips and Eskimo kisses every night before bed. The time he picked up his strider bike and started scooting along with no help! The way he tries to lick the frosting before blowing out the birthday candles. How excited he was when we gave him his drum set. The way he played peek a boo with uncle Kevin. The way he kept asking uncle Kevin to fly him around. The time dada had him take his pjs to uncle Kevin to put on him and he laid down perfectly still on the couch! He always fights us on pjs. The way he says “yea” and nods his head in agreement when mama and dada are having a conversation. 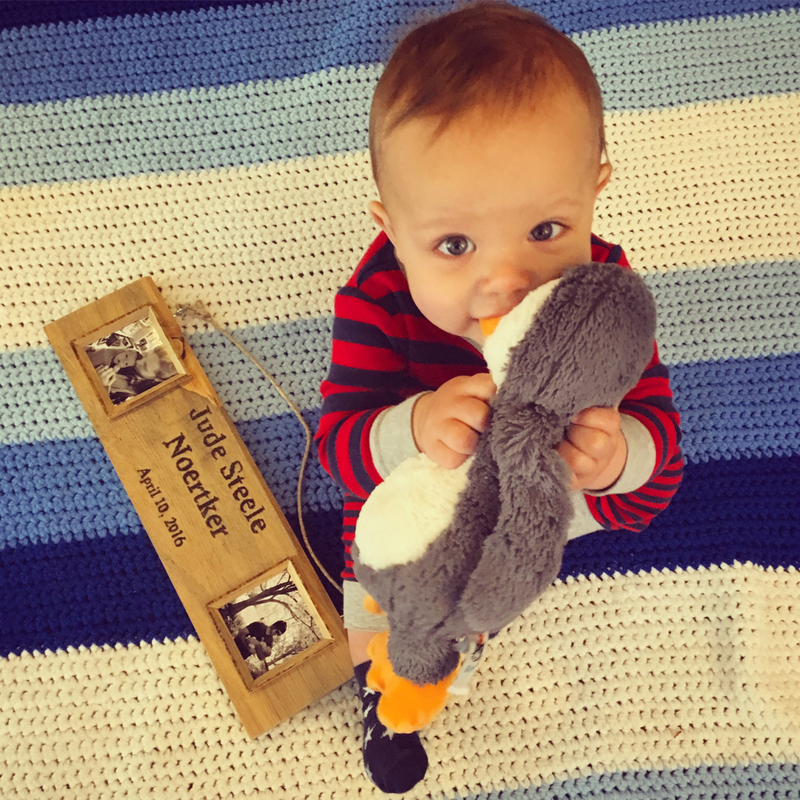 This is Jude's last monthly update before he becomes a big brother and I have two monthly updates to share each month! He is talking more and more, is incredibly helpful around the house, plays independently more each day and gives mama’s belly tons of kisses. 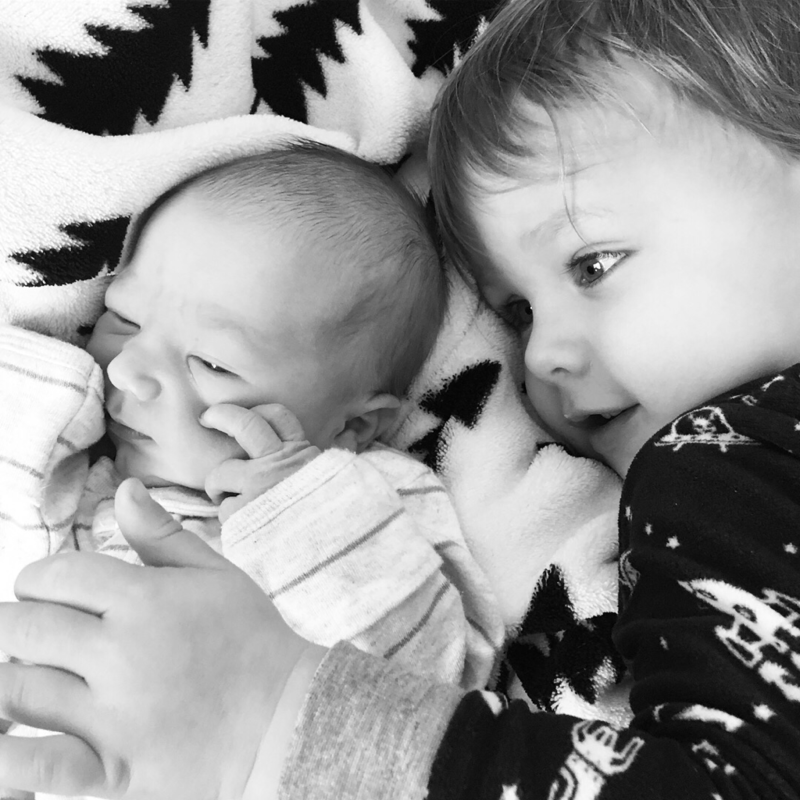 He is going to be the best brother! Clothes Size: starting to outgrow 18-24 month, 2T, honestly might need some 3T soon! Health: we all had colds this month and took awhile to get over them. Nothing major though. Sleep: one longer midday nap, nighttime sleep is all over the place. Diet: still nursing, still eats everything. Loves to ask for dark chocolate at 8 am with an especially adorable grin. Will eat sour cream like yogurt and eats condiments and dips with a spoon. Has started really being able to repeat new words that we ask him to say. The way he handed our museum tickets to the ticket checker and then ran straight into the museum while growling excitedly! The way he growled hello to all the dinosaurs and then waved and blew kisses goodbye. The way he hugged and kissed a little girl about his age goodbye at the museum when it was time to go. The way he observes bigger kids and then copies how they are playing. The time he laid his head on Ellie's chest and gave her a big hug. The way he runs in circles in our living room and runs to us on the couch to give us hugs. The time I asked him what he wants to call Uncle Makena and he said "Bubba!" The way he asks for Nana and Bubba and points at the door. The time I was on the phone with my mom and he said "Nana!" and I said "It's your other grandma." and he said "Tutu!" The time I told him we were going to have lunch with Grandpa Gary and he said "Papa!" The time we went to Open Gym at Black Diamond for the first time and he jumped in the foam pit and yelled "Bo! Bo! Bo!" and jumped up and down. The way he uses his toy screwdriver and hammer to “fix” all our furniture. The time on Christmas night that he would run down the hallway, look to make sure mama was chasing him and then speed up, hide in the closet, yell “nana!” when I found him and then run back down the hall to give nana. hug. Christmas morning when he ran out to the living room in the dark (since nana and uncle Kevin were sleeping in the living room), found his new ball from the day before, yelled “ball!” And threw it down the hallway chasing it and laughing. The way he chased the new remote control car around while daddy drove it on Christmas morning. The way he kept grabbing presents and carrying them to everyone to open them up. The time he tore open his present from nana on Christmas Eve before she even got in the door. The way he kept rubbing his cheeks against uncle Kevin’s scratchy beard. The way he squints and puts his hands in front of his eyes to tell us he is going to hide. The way he slowly backs against the wall in our closet to hide. The time he and Otto played hide and seek and every time he found Otto he tickled him and giggled. The way he points to his nose to say he wants an Eskimo kiss and then grabs our faces at the end of the Eskimo kiss to give real kisses. The way he says hi and waves to strangers, especially other little kids. The time he gave mama a kiss and then yelled more more more! And gave more kisses. The way he lists all his family members and always includes “rara” (car). The time he stood up on his chair when we were at a friend’s house for dinner and yelled more more more while pointing at the brownies. The way he yells dada and jumps off the couch when he hears daddy’s car pull in. 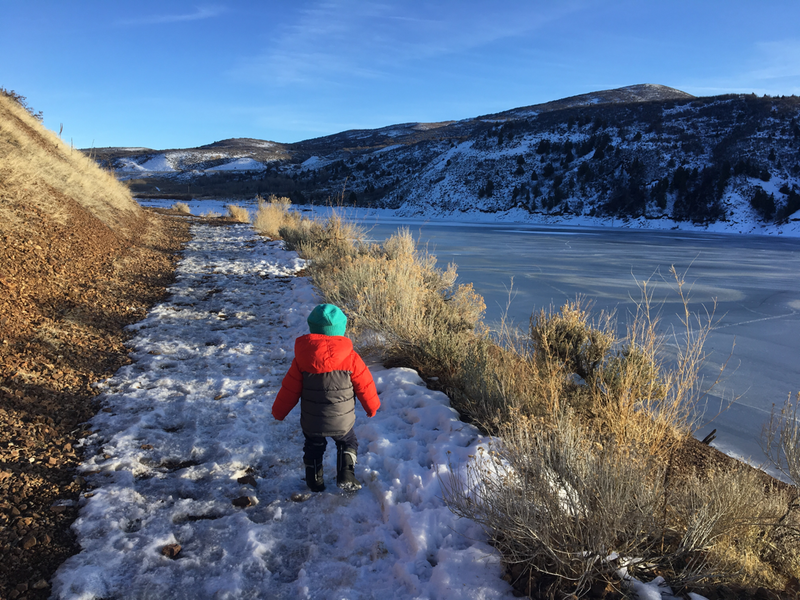 The way he retells the story of the dog licking his face on our hike. The way he walks and hikes on his own for short distances. The way he yells “knife!” anytime there is a package he can’t open himself and grabs his tiny plastic toy knife. The time he showed McKai all his favorite things at the museum. Jude seems to be on the verge of a language eruption! He is talking more and more and seems to learn a new word or animal sound every day. He has the greatest sense of humor and loves to make us laugh. He is loving and affectionate and full of energy. He sits and snuggles to read books, helps cook and clean and loves to chase and hide from Daddy. 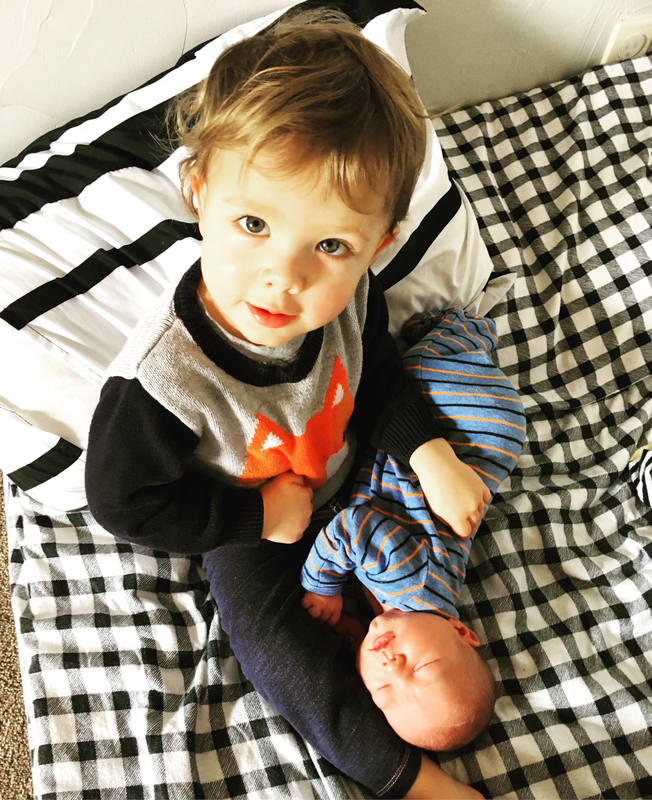 He takes care of his baby and his animals and is going to be the very best big brother! Health: He had a cold and a fever a few weeks ago and we all got the worst night of sleep we have had in his entire life. Thankfully he is all better now! Sleep: Sleep hasn't been great this month. His cold really threw off his sleeping routine since he slept with us for a few nights while sick and was taking naps all over the place. Most nights goes does around 7:30/8, wakes up once or twice (sometimes not at all, sometimes more) and then wakes up between 7 and 8. Sleeping later than before so that is nice! If only Mama didn't have pregnancy insomnia and lie awake for hours most nights. Diet: Obsessed with fruit smoothies and dark chocolate. He's a big fan of all the Christmas treats our sweet neighbors have been bringing over recently. Loves dips, cheese, yogurt, pineapple, raspberries, cucumbers, baked sweet potatoes and potatoes, chicken, pasta.... Still nursing and drinking whole milk. 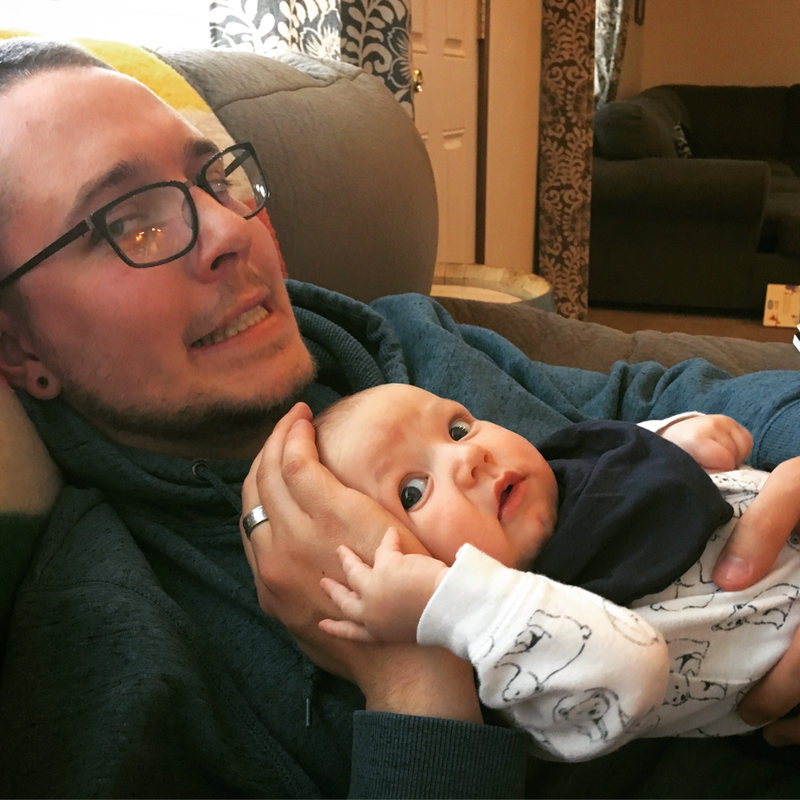 ​He said his first sentence: "dada bubbles"
The ​time he was so excited to have bindi visit that he kept accidentally tackling her when giving her hugs. The time he and bindi kept playing hide and seek with each other around the dining table. The time he laughed so hard because daddy was splashing in his bath. The time he and bindi ran to his room and came back with her holding all the puzzle pieces and he just smiled and pointed I what she was holding. The way he asks for bubble baths "bub bub" every day. How much he loves watching the chickens and donkeys that live across the street from us and always waves hello and blows kisses good bye. The time he blew a double handed kiss for uncle Makena. The way he took bites out of the apple slices and put them back in the dish when "helping" make apple cranberry crisp for thanksgiving. The time everyone arrived for thanksgiving dinner while he was napping and when he walked out of his room and saw everyone he slowly backed away and asked for daddy. The time at the play cafe that he quietly sat next to me playing kitchen while I chatted with Lexie for at least 30 minutes. So independent! The time at the play cafe that he kept bringing toys to baby Ellie, holding her hands and letting her grab his toes. The time he kept giving Norah big hugs in the wagon. 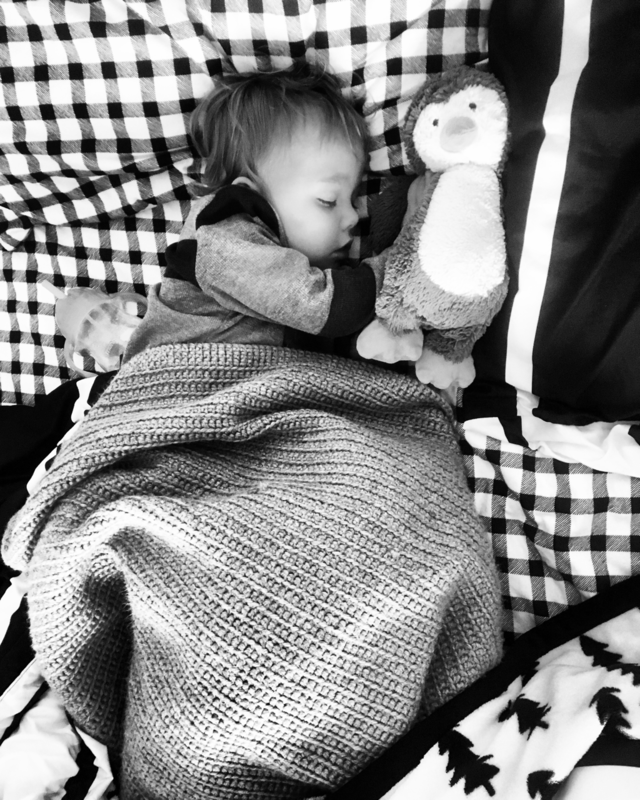 The time he ran into his room in the morning, grabbed his stuffed animals and water and threw them in mommy and daddy's bed and climbed in for more snuggling. ​The way he says "ice" and scrunches up his whole face. The way he shares his water with all his stuffed animals, especially Mr. Penguin. The way he waves and blows kisses to the donkey across the street. The way he waves to strangers and they always give him the biggest smile. 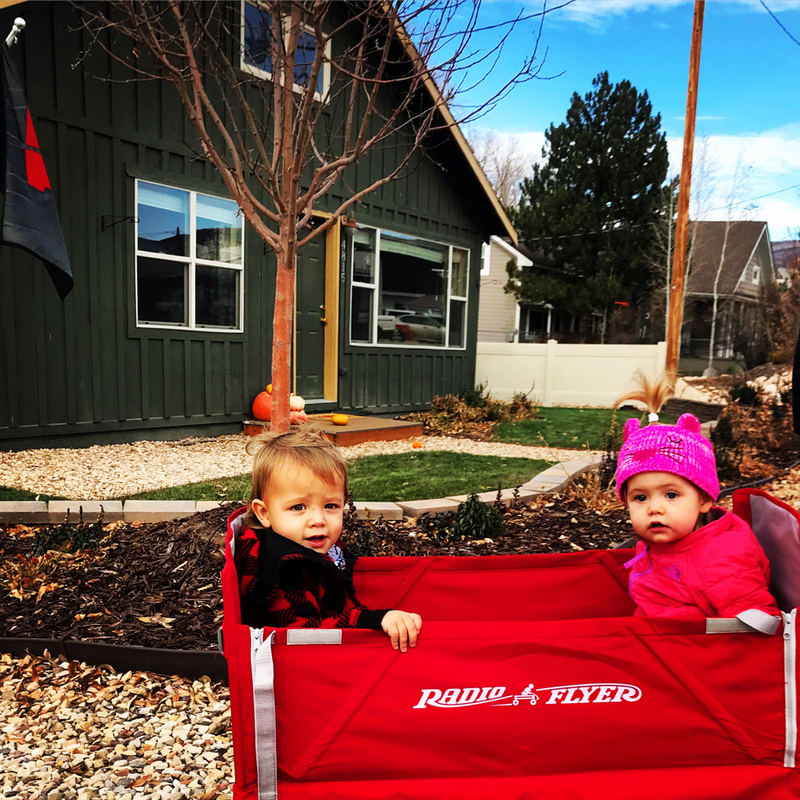 The time Uncle Makena and Sarah left and he tried to push Tutu out of the house too. The way he grabs our hands and takes us to show us something. His donkey and rooster sounds. The way he makes a whirring sound to ask for a smoothie. This age is exhausting but so much fun! Jude seems so mature recently (must be preparing to be a big brother!!) and is learning so many new things every day. He is incredibly helpful and is happiest when he is helping us with something. 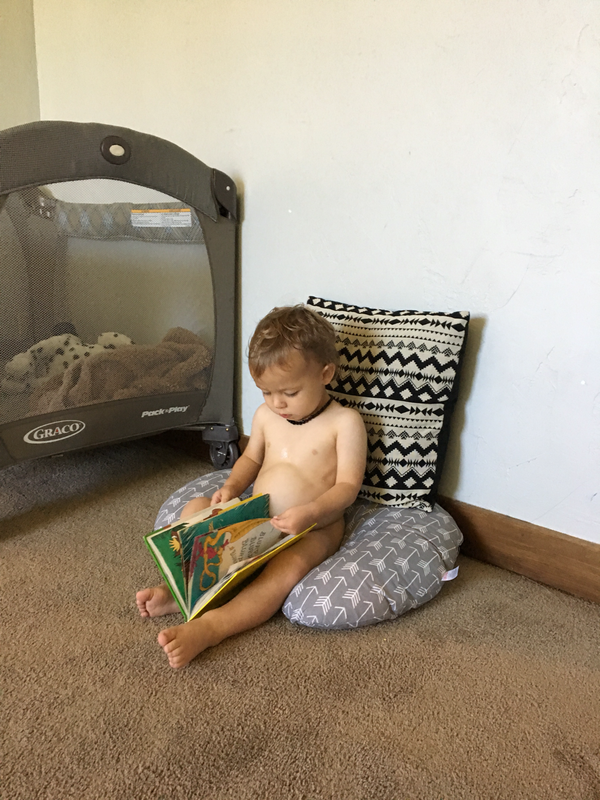 He loves to read, plays more independently and started sleeping in a big kid bed this month! He is extremely opinionated, stubborn and determined. 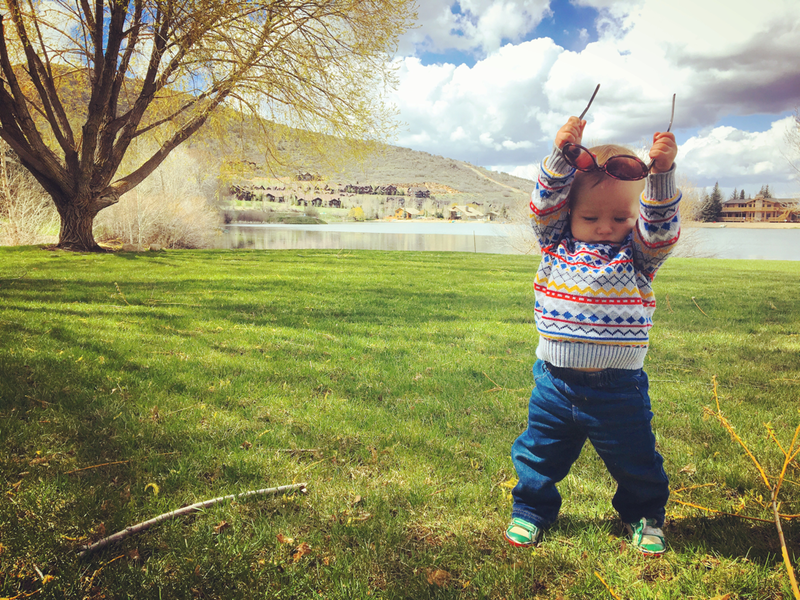 He retells stories, makes animal sounds and dances like crazy to make us laugh. We love seeing more of his personality every day! Health: Back to his normal healthy self! Sleep: Has started sleeping in a bed and is doing so well! Changing the clocks has thrown off his wake up time a bit but hopefully he will adjust soon. We also changed his bedtime to 8 and he usually sleeps until 7, sometimes waking once (or more with the bed transition) and sometimes sleeping through. Diet: Still nursing but also drinking lots of whole milk. Asks for bananas but doesn't usually eat them. Loves yogurt and makes a huge mess eating it. Loves eggs, pineapple, strawberries, raspberries, pasta, grilled cheese, chicken, and Halloween candy. He started sleeping in a bed instead of a crib. He started making the kiss sound when he blows a kiss. He takes out toys and cleans them all up all by himself without any prompts. He puts away laundry in the correct drawers without being asked. The way he steals the whole piece of fruit when we try to share just a bite. The way he claps and smiles when he puts toy away, throws something in the trash, sets his bowl on the table, etc. The way he puts one rock on his shovel and then practices balancing and carrying it as far as he can. The way he says "dada!!" in the happiest voice every morning and then gives Daddy lots of snuggles and kisses. The way he runs his chest to ask to nurse. ​The way he points to the milkshake and says "mama!" when we go to the polar king, demanding that daddy feed me bites of milkshake and then he smiles and leans his head back and gives me kisses after every bite. He enjoys watching mama eat milkshake more than he cares about eating it himself! The way he grabs the oven mitts anytime I start using the oven or stove. The way he sits down and watches carefully while I take things out of the oven. The way he runs as fast as possible and completely naked into the living room and into one of our arms when the other parent gets him out of the bath tub. The way he washes his own hair and tummy. The time he pretended he was going to share his cookie with me, only to pull it out of my mouth and devour it in front of me, followed by a crazy arm swinging dance. The way he sometimes says "ma da," a combination of mama and dada. The time he bonked his head on the couch and then reenacted it, saying "ooh!" in a sad little voice and putting his head against the same spot in the couch about 10 times in a row. The way he shares snacks and drinks with his doll and stuffed animals. The way he tucks his toys in for naps and waves good bye. The way he pouts and says "oh" when he asks where daddy is and I tell him he's at work. ​The way he shares his milk with my belly. The time I was trying to get him to say "baby" and he just kept laughing and saying "bob." The time he noticed crumbs under his table, grabbed my hand, led me to the closet to grab the broom, then took the broom back over to sweep up his crumbs. ​The way he retells and reenacts stories. The time we left daddy's office and right outside the door he yelled dada! Dada! and blew kisses. The way he says "oooh!" and opens his arms wide when he shows us something. The way he grabs our hands to lead us somewhere. 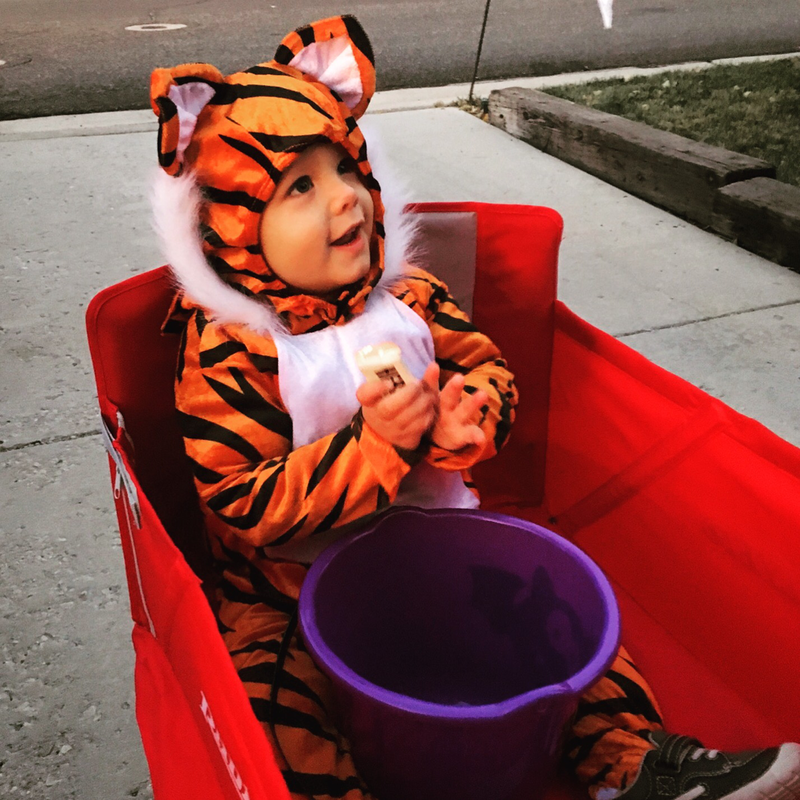 The way he started grabbing more and more candy as the night went on while trick or treating. The way he gives mamas belly kisses and hugs. The way he hugs the page in tacky the penguin when he other penguins hug tacky. It has been a big month! 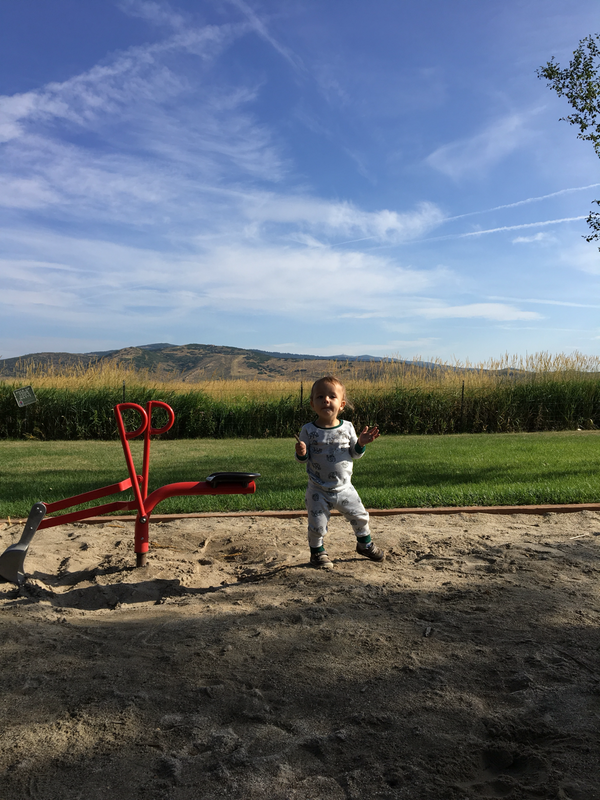 We moved into our new beautiful home in Oakley and Jude absolutely loves having a house, a yard and a playground right across the street. He has had a new jump in independence this month and is funnier and sweeter than ever. He loves playing games that involve chase and end in hugs and is so much fun at this age. Health: Several colds this month. Pretty much a constant runny nose. Sleep: Sleep was a bit rough with the sickness and naps were out of whack a bit after moving but we are getting back to routine. He is doing really well sleeping considering we just moved to a new house. Diet: Still nursing. Obsessed with bananas and asks for them constantly. Loves pickles again and requests going to kens kash to buy more. Loves pot roast, carrots, celery, pears, meat loaf, mac n cheese, waffles "wuh wuh", herbal tea, berries, grapes, potatoes, ritz crackers, yogurt and cheerios. He can climb onto the couch by himself. He follows one and two step directions. The way he asks to read Mr. Brown Can Moo. Can You? about ten times a day by buzzing and poking his own tummy (the bee page is his favorite). The way he growls when he wants to read Mr. Tiger Goes Wild. 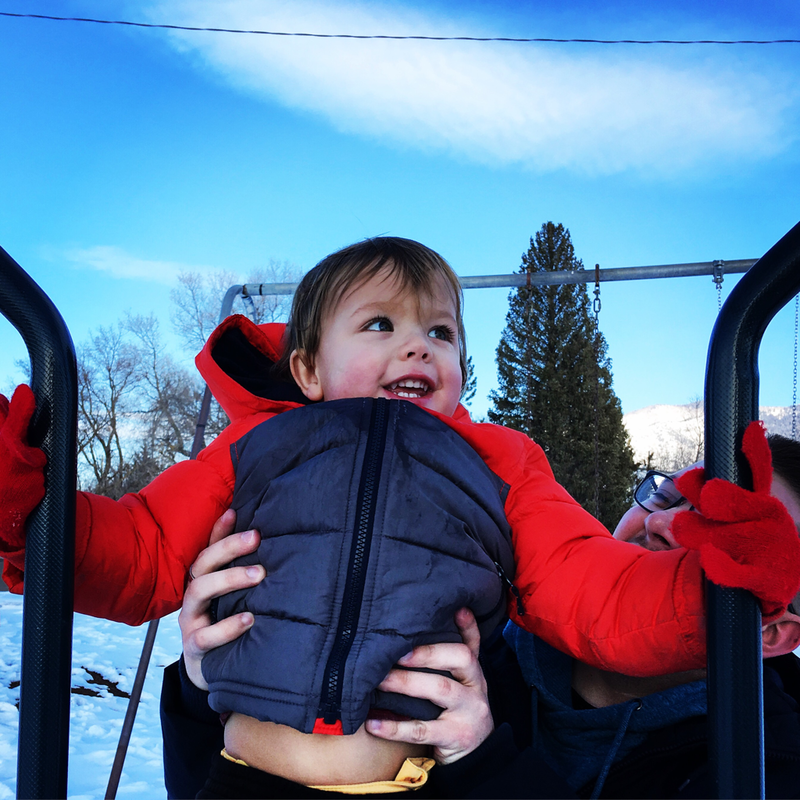 The time he sat at the top of the slide, extended his arms saying "Mama" to ask for help and started going down all by himself. Then he practiced going down by himself over and over again. ​The way he grabs our hands and claps them together. The way he flaps his arms and opens his mouth wide open excitedly when he feeds someone. The way he points and clicks his tongue when he wants to buy snacks at Ken's Kash. The time he ran into the kitchen by himself right when he woke up and sat down at his table to eat leftover crackers in the dark. The way he offers his hand for people to kiss his palm. The way he insists on going out on the porch to wave goodbye to daddy when he goes to work. 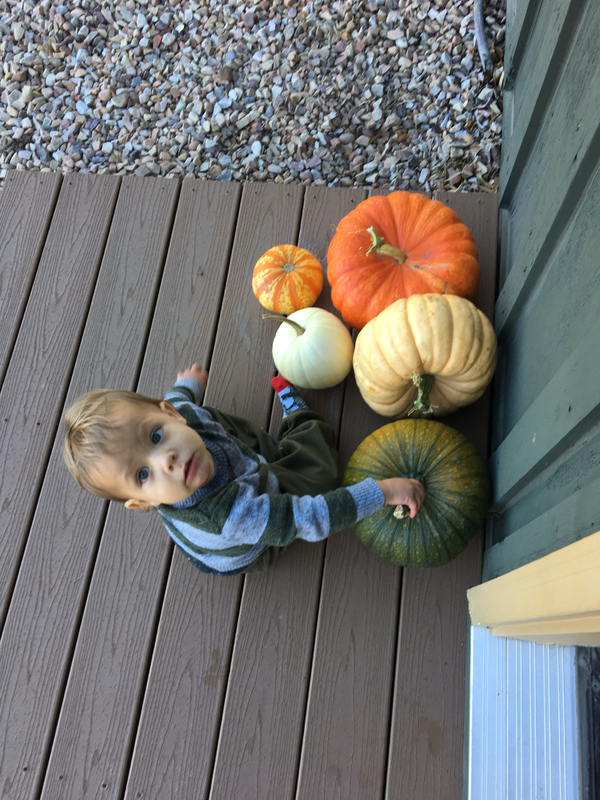 The way he asks to go outside to see his pumpkins on the porch. The way he started doing his arm swinging dance and spinning in circles when we moved into our new house. The look of pride he gets on his face when he shows people the house and especially the garden. The look of pure joy on his face when he smacks the wall with the fly swatter. The way he requests the same books over and over. The way he runs around with his pillow so he can crash into the floor. The time daddy was holding his baby doll and Jude lifted the baby's feet for daddy to kiss. The way he runs as fast as possible to mama to give a big hug after bath time. The way he giggles when daddy tickles him and when he tickles daddy back. The way he does his little buffalo grunt when he wants to play buffalo with daddy. The way he stares at strangers with his special charming grin until they smile and wave at him. The way he yells "pa pa" and points aggressively to ask to go to the park. His blast off arms where he bends his knees and puts his arms straight behind him to start running. The way he sings to himself when he is playing. How much he loves playing with spoons, bowls and putting things in bags. He has to have two of his own drawers in the kitchen. The time he helped mama put all the chopped veggies in the crock pot and then started taking them out of the crock pot and putting them into the fruit bowl when he ran out of veggies. The way he helps harvesting in the garden: putting potatoes and clumps of dirt (guess they look like potatoes) in the basket, carrying carrots to the basket, bringing mama the trowel and gloves. The way he is completely entranced when we read Tacky the Penguin. The way he claps at the top and bottom of the slide when he does it himself. The time he and McKai chased each other around our empty living room, sat together at the tiny table and insisted on having the train and stuffed dog sit with them, and waited at the top of the slide for each other so they could slide together. The way he gives Otto high fives and tickles ellory's toes and holds her hand. The way he hugs and kisses his baby doll. 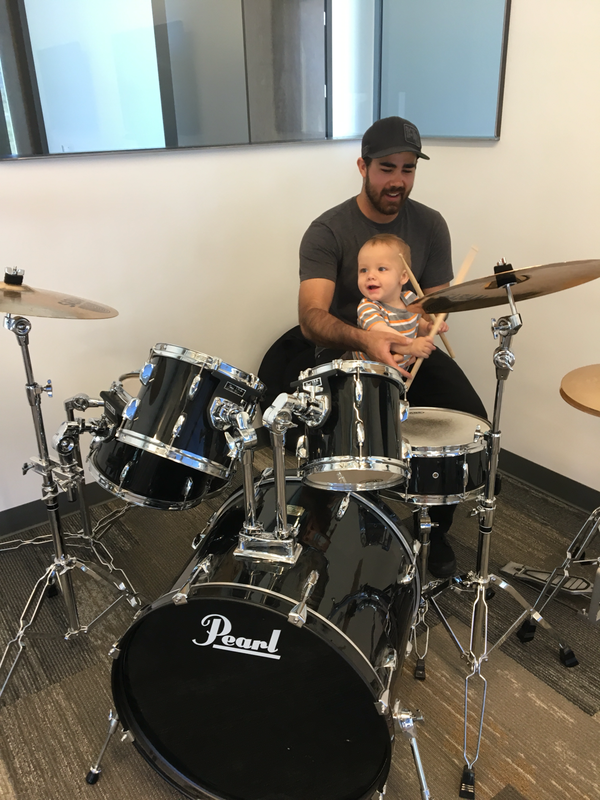 ​The time daddy was staying at work until band practice and Jude said "dada?" And I said "dada will be home after you are asleep." And he said "oh" in the most disappointed voice, closed his eyes and put his head on my chest. 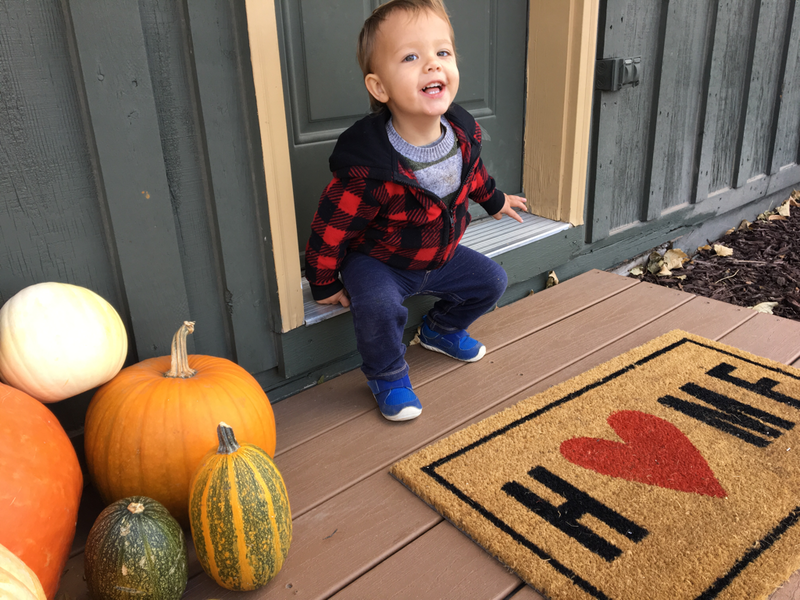 The way he insists on saying good morning and sometimes good night to his pumpkins on the front porch. The way he touches the spot between his lip and nose to say "pumpkins". 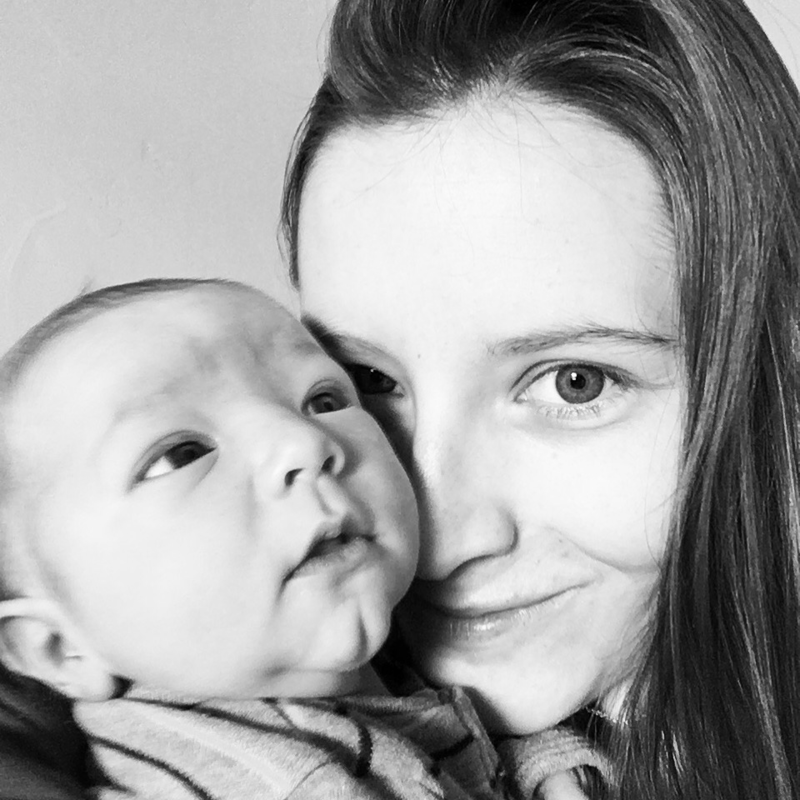 To be honest, this last month has probably been one of the most difficult months of parenting yet! Jude has hit full-blown toddler mode full of tantrums and whining. 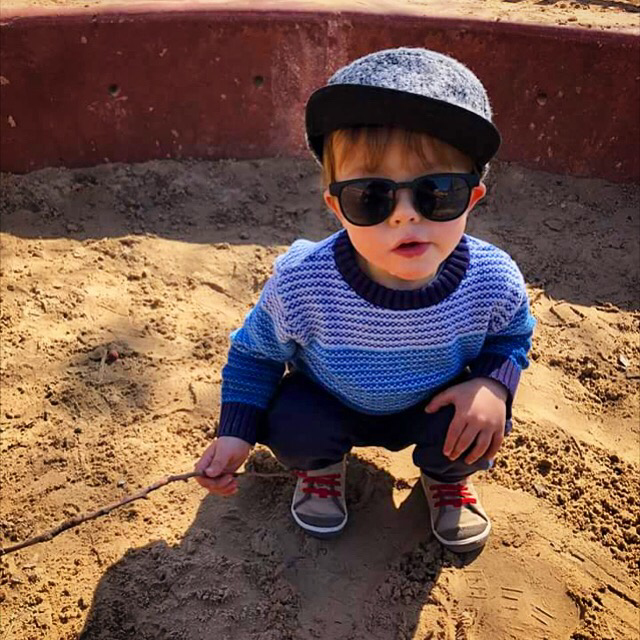 He is also obsessed with reading books, making animal sounds, dancing, doing yoga and learning new things every day. We love you, crazy bug! Clothes Size: 12-18 month and 18-24 month. 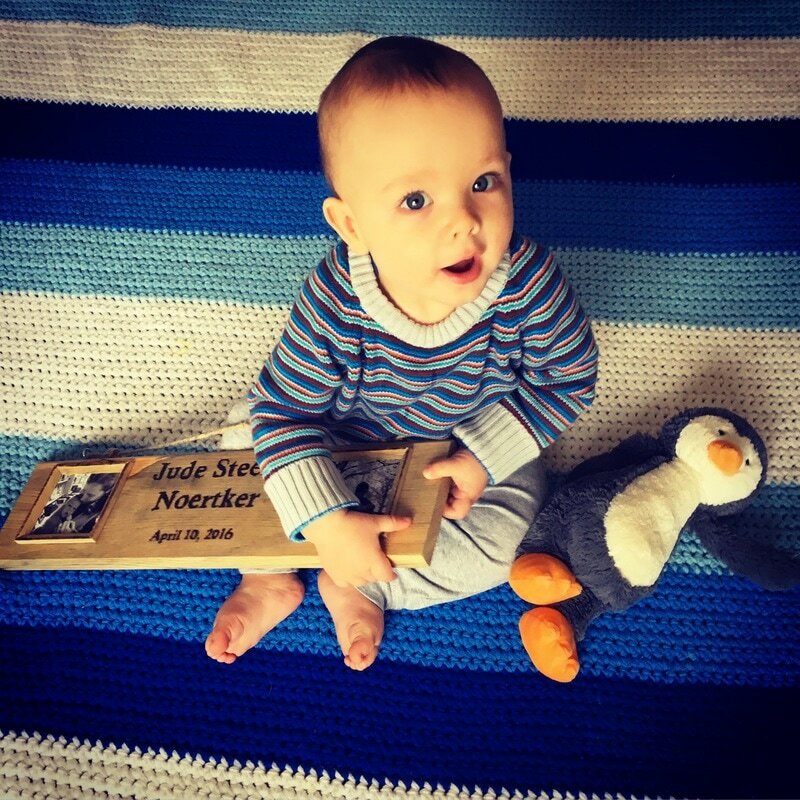 Health: Jude had two colds this month and was pretty much teething the whole month. His bottom canines have FINALLY broken through. Sleep: Sleep has been severely disrupted by sickness and teething. One nap in the middle of the day (Mama naps too! ), sometimes a small morning catnap and then a bigger afternoon nap. Naps have been great, working on getting back into the regular nighttime routine. Diet: Slightly pickier but still mostly eats everything. Still nursing. Loving pears, grapes, strawberries, toast, waffles, pasta, pizza, eggs, chicken, fish, sweet potatoes, and bananas. No longer likes pickles. Prefers to roll them in the carpet. All four canine teeth have broken through! The time we were at the natural history museum and he saw the short-faced bear skeleton and started growling at it. ​The way he holds his arm up like a trunk to be an elephant. The way he calls The Pout Pout Fish "Bub Bub" because it says "blub, blub, blub" over and over again in the book. The time he started climbing the railing at the library like a ladder when I had no idea he could climb ladders. The time he put both hands on Josie's little face and gave her lots of kisses. The way he practices walking backwards with a look of concentration on his face. The way he goes down slides by himself on his tummy. ​The way he says "mow" (rhymes with cow) instead of "meow." The way he holds his hand out in a little cup to ask for bread. The way he reaches both arms out and puts his wrists together and says "Mama!" How he pretends to talk on the phone and always calls Dada. The way he signs "more" combined with a little yoga bow to tell us he wants to do yoga. The time he asked to do yoga and then sat on the mat by himself in his room, put his hands together and did a little bow and then stretched his arms straight up in the air. The way he calls his black and white animal book "hoo hoo" because it has an owl in it. How excited he gets when he gets to use a spoon and bowl to stir. The way he is always looking for containers to use for his stirring. The way he squat bounces on trampolines. The time he was a little scared of Brett's dog Ellie at first but then started talking to her, saying "woov woov woov!" over and over again. The time he pushed the smell button at the museum that smells like a swamp and said "Daaa!" and stuck out his tongue because it smelled bad. The way he grins at Daddy to have him chase him around the house. The time he woke up in the middle of the night said "Dada!" enthusiastically and fell right back asleep. 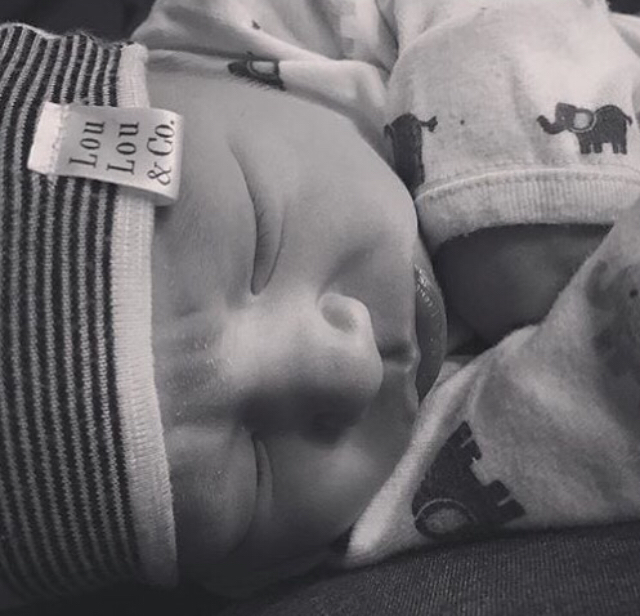 The way he gives Daddy kisses in between nursing. 16 months is even better (and crazier) than 15 months. Jude is getting more independent, especially when it comes to playing on playgrounds and playing in his room by himself. He is so good at playing by himself and keeping himself entertained these days. He is talking more and more and frequently says new words (or at least sounds that we interpret as new words). He knows the function of just about everything and wants to be big, helping with chores, picking out shoes, and always wanting to drive. 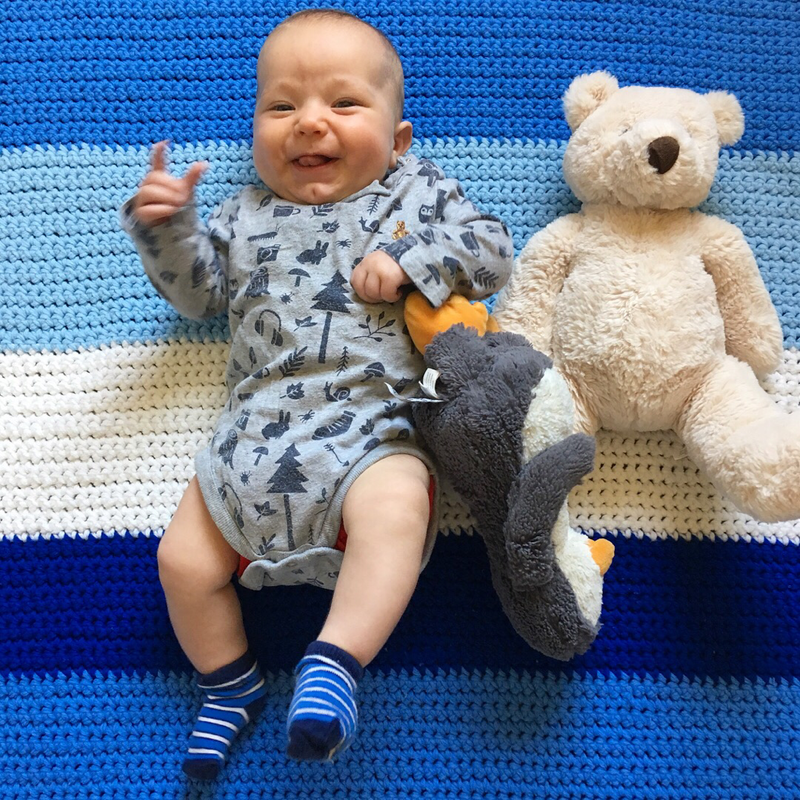 Health: Small cold this month combined with teething. The cold really only seemed to bother him for a day but he had a runny nose for about a week! Sleep: Naps are kind of all over the place. Sometimes one, sometimes two. Still waking up around 6 am, going down at 7:30 pm. Diet: Still nursing and still eating everything. Obsessed with sweet pickles and asks for them daily, sometimes at 6 am. Loves avocado toast, scrambled eggs, meat of all kinds, especially chicken, pizza, enchiladas, tacos, blueberries, apricots, cherries, stir fry, cereal, bananas with almond butter, fruit smoothies, etc. He can climb onto chairs. He walk up and down stairs while holding our hands and sometime just putting his hand on the wall. He can go down slides by himself (usually slides on his tummy feet first). He has all four canine teeth slowly coming in. Created a sign for "pickle." 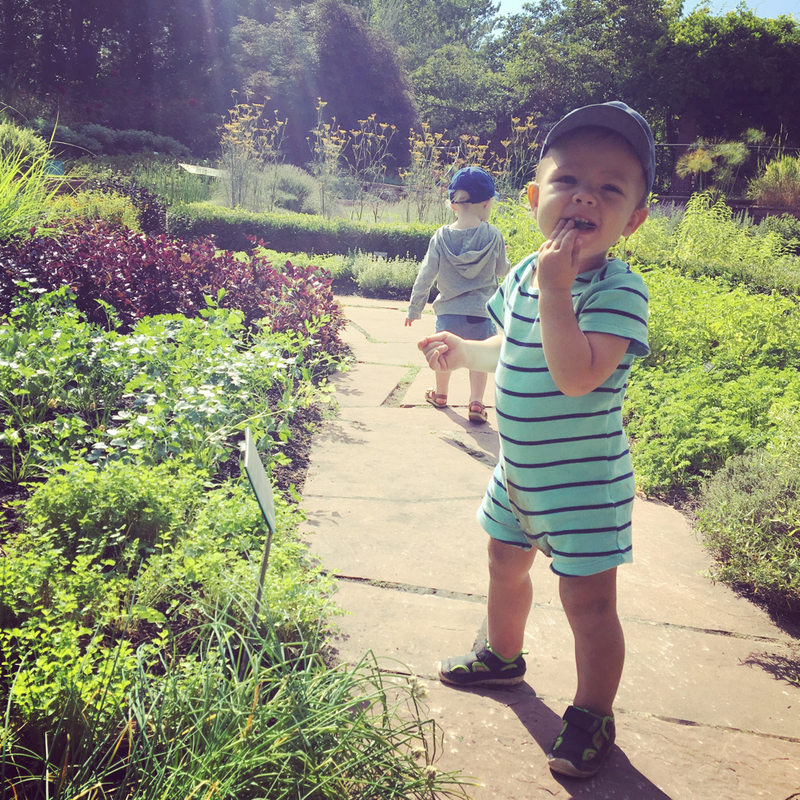 The time we were walking through the garden at Miner's Hospital while a camp of preteen kids were eating lunch and a preteen boy exclaimed, "WHAT?! He's so cute! I CAN'T HANDLE IT!" The time he fell asleep in Mama's lap while we were paddling around Trial Lake. The way he bounces up and down when we let him "drive." The way he insists on sitting right in between Mama's and Daddy's heads during morning snuggles and gives Daddy tons of kisses. The way he is always asking where Daddy is. The smirk on his face when he practices walking backward. The time I found him sitting on the dining room table smelling (but not touching!) the vase full of roses. 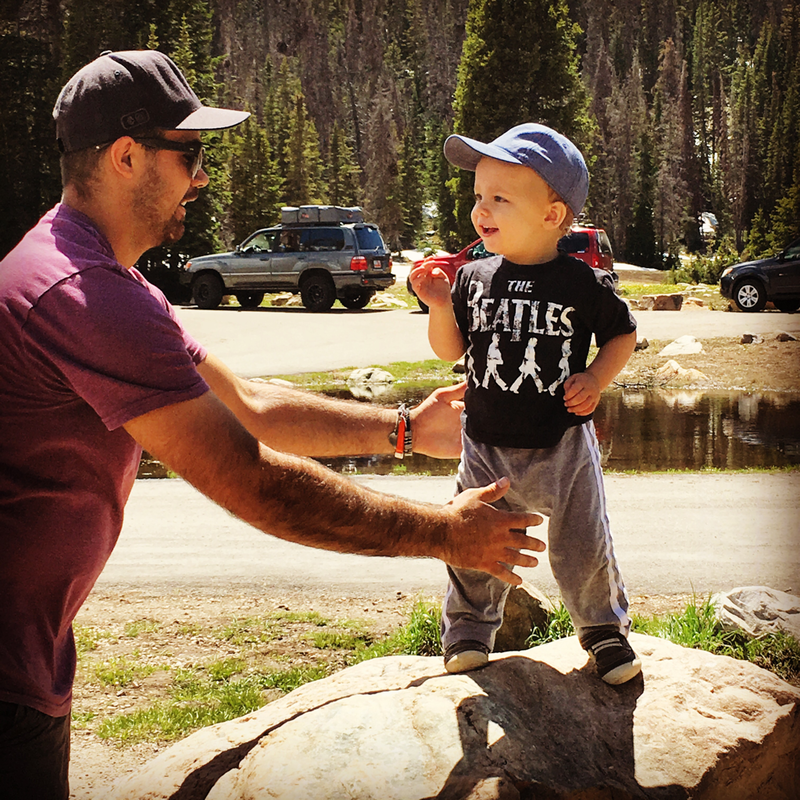 ​The time he and Wyatt kept giving each other hugs and kisses at the Deer Valley concert. The way he was dancing and bouncing and swinging his arm and laughed every time Wyatt copied him. The way he calls his Pout Pout Fish Book "bub bub" because the fish says "blub bluuuub bluuuuub" over and over again in the book. The time he chased the ducks around at the "lake park" while making a quacking sound. The time he kept asking Sarah for more bites of her mac and cheese by signing more, tilting his head and giving her a little smile. The time he grabbed pieces of lettuce out of Sarah's sandwich to eat. I guess he can tell she loves babies. The time at storytime that he was doing his bouncy dance for the other parents and then kept lifting up his shirt and pointing to his belly button. His excitement the first time he sat in one of the car grocery carts at Whole Foods. He switched back and forth between the two steering wheels the whole time. The way he points and says "Dada" every time we drive by Daddy's office. The way he rubs his hands on his tummy when we say it's time for a bath. The way he grabs Daddy's face and gives him kisses. The time I caught him with my phone and he gave me the most startled look, froze and then ran away. The way he waves to everyone at the park and follows the big kids around, copying what they are doing. 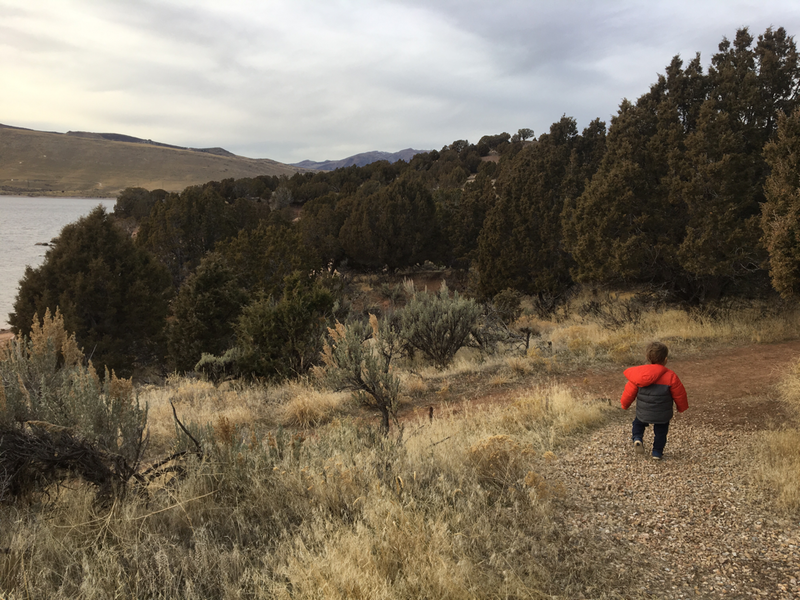 The time he was crawling up the rock steps at Willow Creek Park and would stand on each step before crawling up the next, raise his arms in the air and say "yay!" Sleep: Back to the two nap schedule and no complaints from Mama about that! Naps 10-12 ish, 3-4 ish. Bedtime at 7:30, wakes between 6 and 7. Working on him sleeping in his crib all night and he is doing so well! He learned how to open doors! He got his fourth molar. He learned how to use zippers. The way he grabs his shoes and Mama's shoes and starts banging on the front door when he wants to leave the house. The way he chased after Candace's cat, doing his "I want to pet you" sign and calling her a "woov." The time he chased after a seagull at the beach doing the "I want to pet you" sign. 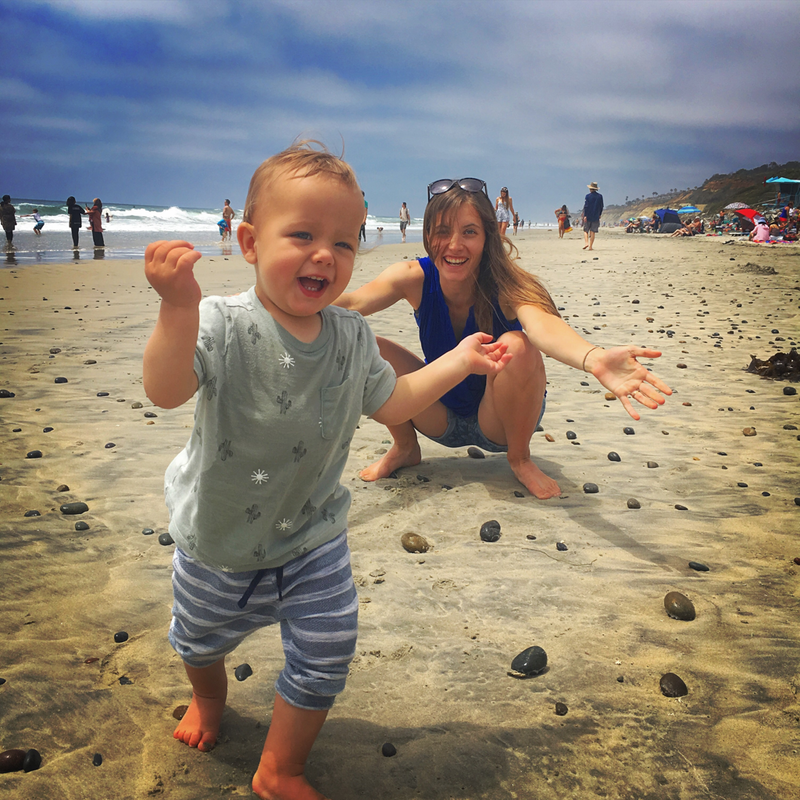 The way he ran in circles around our towels, laughing and falling all over the place when we first got to the beach in San Diego. The way he led Uncle Kevin all over the park, pointing and saying "there!" The time he kept giving Bindi big hugs at the Deer Valley concert. The time he befriended the teenage girl at the Deer Valley concert and kept going over to sit by her, wave, smile, talk and share his hat with her. The way he leans back with the hugest grin on his face. The time he yelled "A LA LA LA LA!" to the people at the table next to us at Windy Ridge and the mom said it back and he gave her a double point and huge grin. The way he double points and smiles when he is really happy and excited. The morning in San Diego that he woke up early and then snuggled into Daddy's chest and fell back to sleep. The way he blows kisses by just putting his hand on his mouth. The way he carries his new stuffed animal woov around and gives him big hugs. The time I told him it was time for a nap and he grabbed his woov to bring him upstairs and into his crib. The time we were driving to pick up Daddy from work and I told Jude we were picking up Daddy and he started yelling "Dada! Dada! Dada!" while grinning and doing the famous double point. The way he waves his hands and says "Neh" when he doesn't want something. The way he likes to "drive" before getting in his carseat. The time Daddy met us at the park during a little break from work and all Jude wanted to do was play with Daddy's bike instead of the playground. The time he climbed right on top of the sand box stand at the little park. The time he climbed up the whole slide at the Black Hawk park. 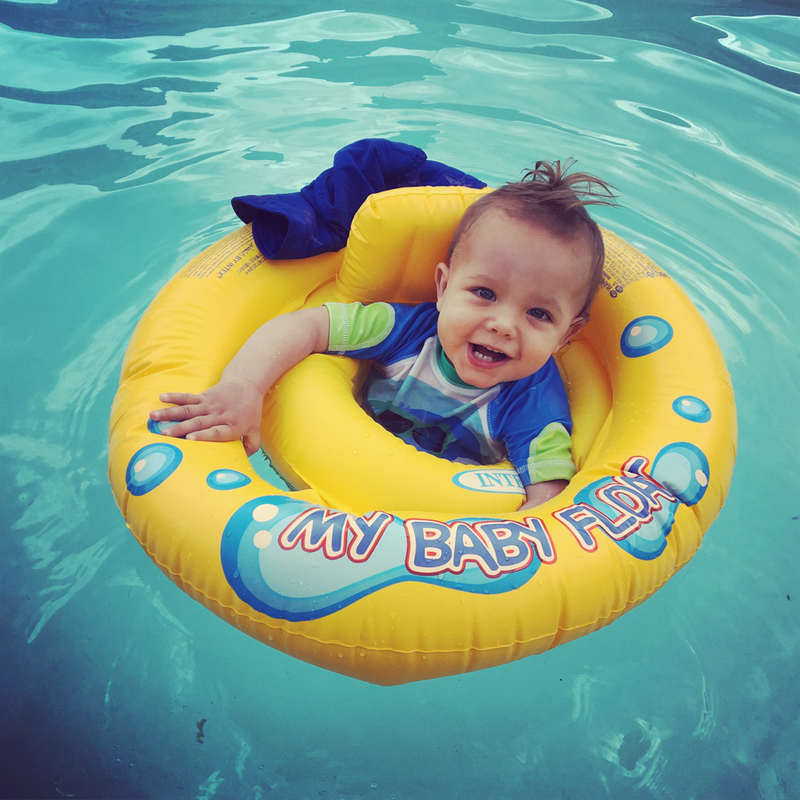 The huge grin on his face when he sat in his pool floaty for the first time and started kicking and splashing around. His excitement when he watched Mama blow up the pool floaty. The time he did laps around the tables at the bagel shop and played hide and seek with Adam. The time he kept linking his arm with Brooke's at the Deer Valley concert and leaning his head way back while laughing. The way he likes to eat whole peaches, apricots and apples and ends up completely covered in juice. The way he calls salsa and other sauces"tsst." The way he insists on dipping anything shaped like a fry or chip (including a bean sprout from pad thai that he wanted to dip in ketchup). His excitement when playing with a play kitchen for the first time at Whole Foods. The way he fell asleep in Mama's arms during take off on our flight to San Diego and slept the whole flight. The way he practiced taking his water bottle in and out of the cup holder at the airport. The way he walked along all the seats at the airport waving to everyone and smiling. The way he squats and throws his arms in the air when he dances. The way he dances whenever he hears music. 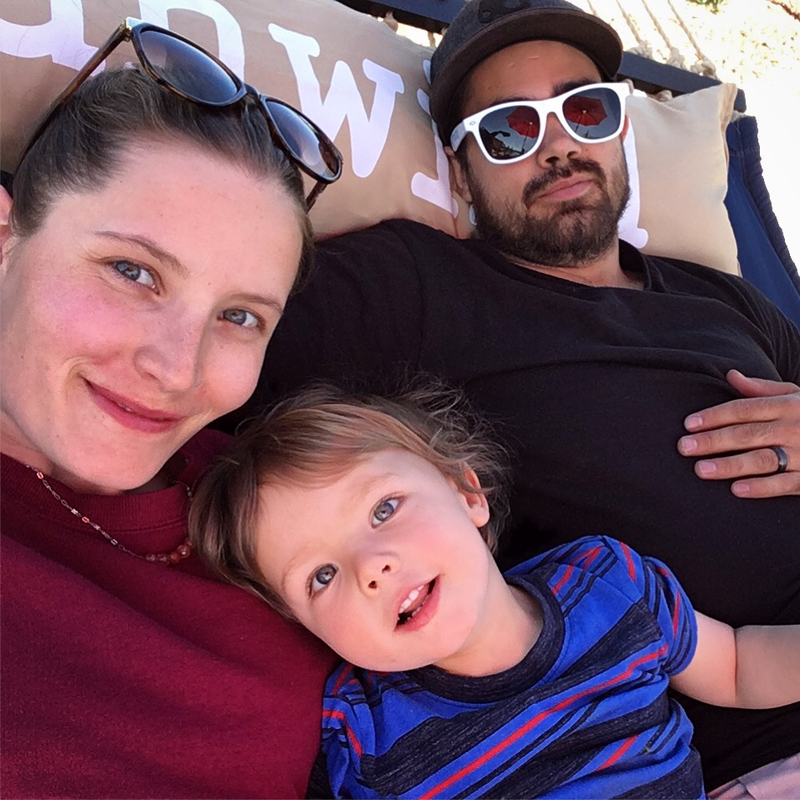 The time at City Park on the 4th of July that Daddy walked over to watch the music and Jude immediately stood up, yelled "Dada" and started chasing after Daddy with both arms outstretched and fingers pointed. The way he takes a bite and then leans his head back and grins when he really likes his food. The way he calls Mama "Mom Mom." The time he went upstairs in the morning yelling "Dada" and knocking on the bedroom door to wake Daddy up. The way he helps wipe up messes with a rag, throws trash away in the trashcan and takes the broom from us to "help" sweep. ​The time Daddy was explaining that we were not going to pick his fork up off the floor AGAIN and he said "Jude, what did you do with your fork?" and Jude mimed throwing the fork on the floor. The time he was playing in the water on his tummy in the bath tub and started snuggling with the water cup because he was so sleepy and ready for bed. His sign for "toothbrush" where he sticks his finger in his mouth and pretends to brush his teeth with a big smile on his face. The time a little boy shared a fossil brush at the Natural History Museum and when Jude was done using the brush he gave it back to the little boy. 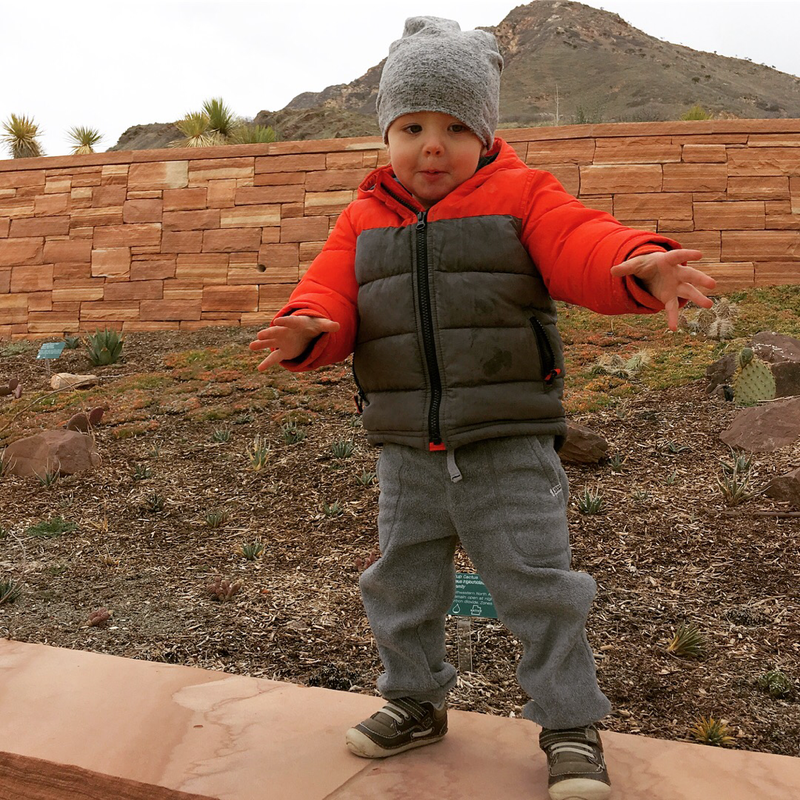 ​The way he threw his arms in the air and gasped excitedly at pretty much every museum exhibit the first time we went now that he is walking all on his own. The time he stood at the top of the stairs yelling "Dada! Dada! DADA!!!" and when Dada didn't hear him he crawled all the way downstairs to find Dada and give him another good night hug and kiss. Jude seems like such a little kid now! 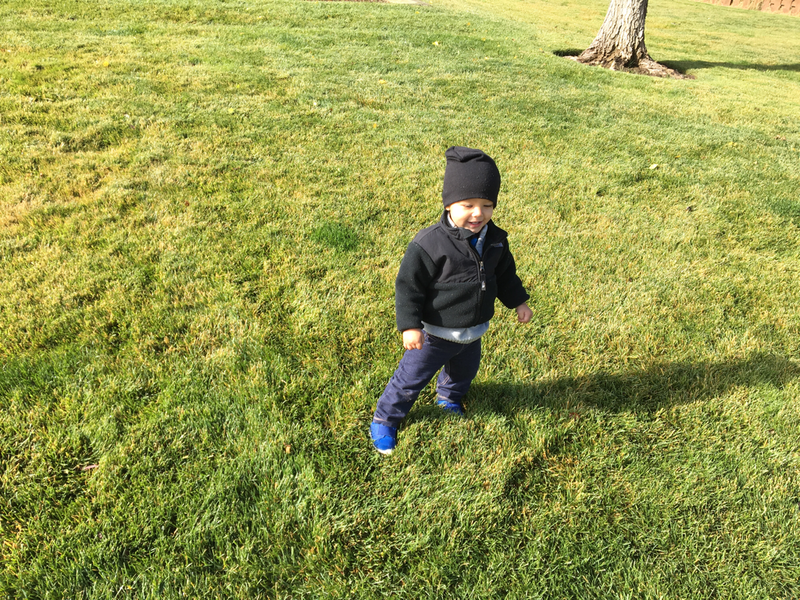 He started walking this month and is busier and more independent than ever. He has the funniest, happiest, most playful personality and is always smiling, clapping, laughing and playing hide and seek. 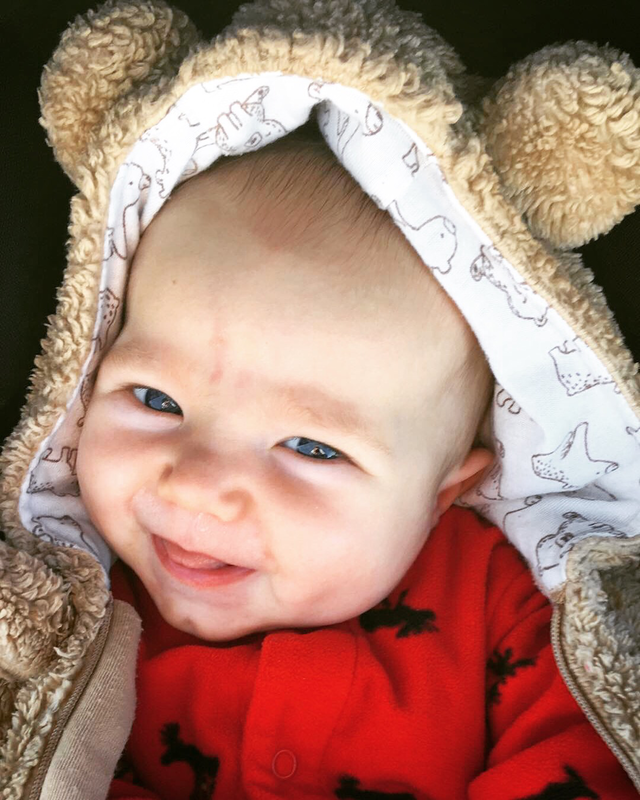 He loves making people laugh, making new friends, and giving hugs and kisses. He definitely understands everything we say, follows directions, and is trying to talk and sign more and more! 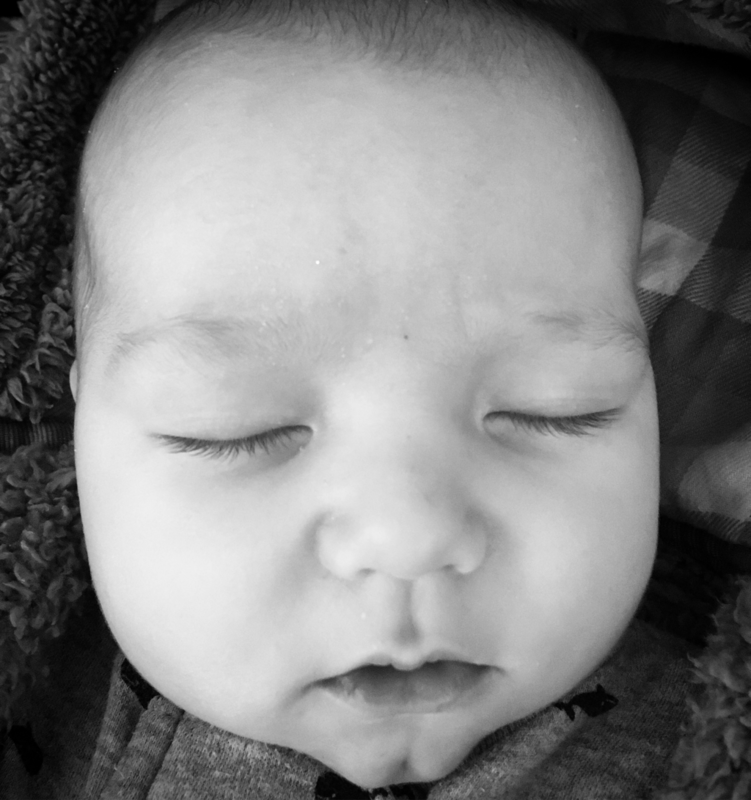 Sleep: This month he has started transitioning from one nap to two but still takes two naps a lot of days. Nap transitions are so tricky! He has also been waking up SO EARLY some days (5:30 am!) I think because of the birds. Still going to bed at 7:30 pm and recently only falls asleep if Daddy gives him a hug and tucks him in. If Mama puts him down he screams. 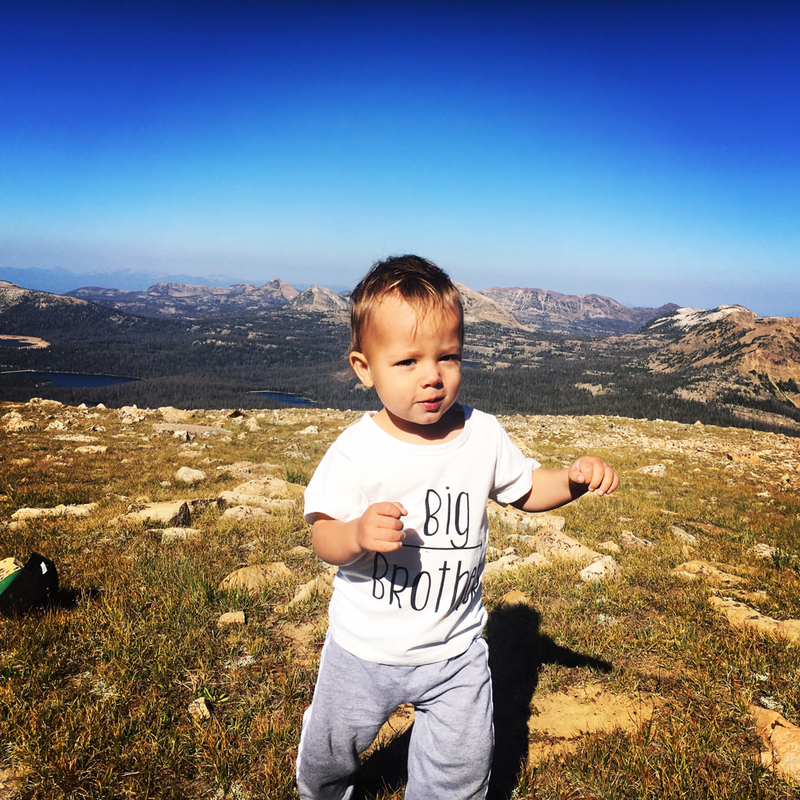 He started officially walking on May 18! We got rid of his pacifier. He learned how to stand up from sitting (after three weeks of walking). He learned how to stack rings and has started stacking blocks. He can follow simple, two-step directions. He has started creating his own signs (hugs and wipes). The time he showed off his walking skills for everyone at Kendra's graduation party and my dad was so proud of him. The time at Kendra's grad party that he walked over to two girls, poked them both and smiled and then would only high five one of them. The time at Liberty Park that he was walking and holding my hand and Kristin went to grab his other hand and he shook it off and went to grab McKai's little hand instead. They tried to hold each other's hands but mostly just put their hands close to each other's, waiting for the other person to grab it. 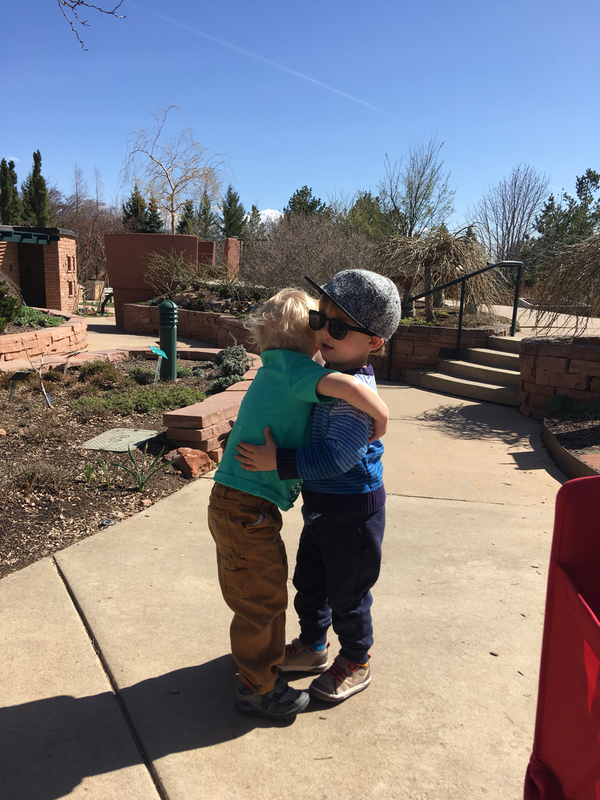 The time he kissed the lizard statues on the head at Red Butte Gardens and insisted on climbing up and down the hill to kiss them all on the head. The time he was whining and fussing and I said "Jude, what do you need?" and he said "A woov." The way he gives open mouth kisses to Daddy in the morning and when he comes home from work. The look of pure joy on his face when he plays his little bongos. The way he and McKai tried to put his hat on each other's heads. The way he "runs" while holding Daddy's hands. The way he says "Mom Mom Mama." The way he has started wrapping his arms around my neck and his legs around my waist when I pick him up. The way he lifts his shirt and pokes around to find his belly button when we ask where it is. ​The time he climbed into the little house at the playground at Liberty Park to play with the big kids. It took about 6 attempts for him to get up on his own and he was so proud when he did it. The big kids involved him in their game and he even pretended to lick an imaginary ice cream cone. The way he shuts his eyes extra tight when he plays "pretend naps." The way he sings and bounces when he is on Daddy's back in the ergo. The way he waves extra fast when he is standing on the balcony and sees Daddy come home. The time he just walked right out of his bedroom and all the way across the living room to me and it felt like he was "officially" a walker! The time he walked to Daddy, said "Dada" and reached to give him a kiss. 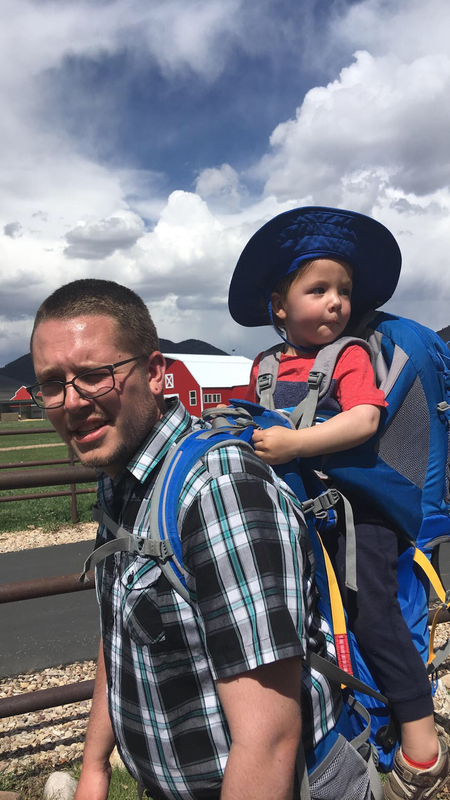 The time we were hiking in Millcreek with Carson and he was asleep while we were hiking down but woke up for just a minute when about 8 dogs passed us on the trail and then promptly fell right back to sleep. ​The way he gets so excited that he flaps his arms and his little face shakes. The time he started kissing the trees at Rotary Park. 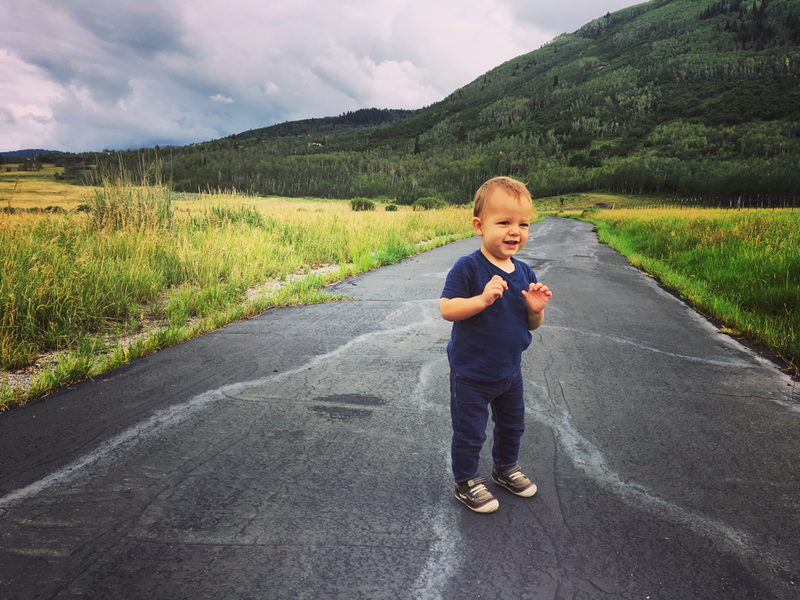 The way he fearlessly walked right into the rattlesnake spitting fountain at Red Butte. The way he stops nursing and says "mmmm" and smiles at me. The time he stopped mid-nurse to start sucking on his toes, giggle and then go back to nursing. 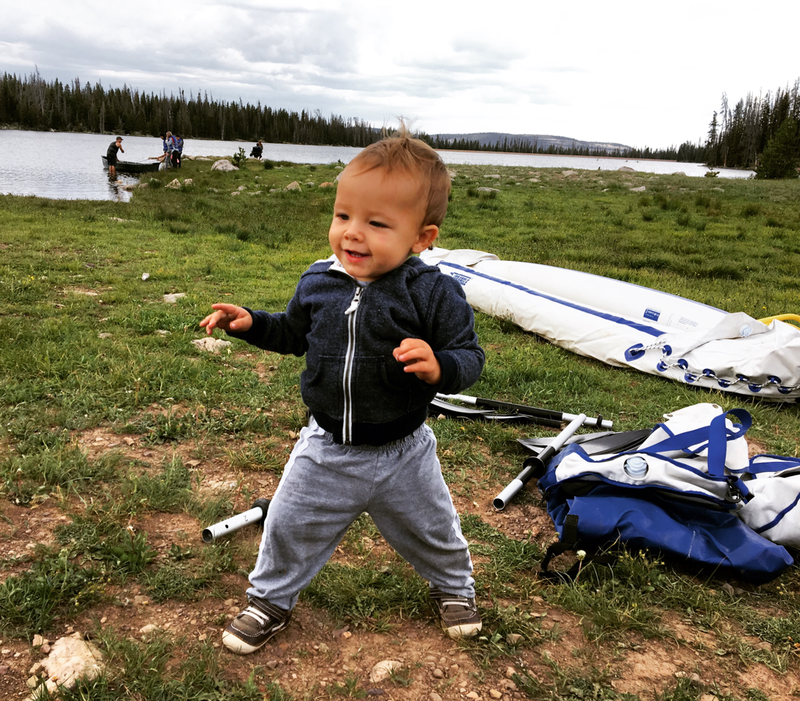 The way he waved and smiled to everyone as they started arriving at our first Outdoor Discovery Program. The time he climbed straight to the top of the playground at the Lake Park and gave me a proud and mischievous look. The way he dips fries, crackers, etc. in sauce so carefully and slowly and hardly even gets any dip and then sometimes just licks the sauce off before dipping again. The way he says "tssst" when he twists his stacking russian dolls. The way he pretends he is going to give a kiss and then pulls off our hats and/or sunglasses. The time he played with the other kids at Norah's birthday party and pretty much forgot Mama and Daddy even existed. The smile on his face when he got to play in the bounce house at Norah's birthday. The time he unplugged Daddy's guitar amp during the band's performance at Norah's party. The time he sat in Uncle Brett's lap and fed him snap peas. ​The way he wipes one hand against the other to tell us that he is done eating and wants his hands wiped clean. The way he puts his hands all curled up under his chin and gives us a huge, cheesy grin. The way he gives the softest little kisses right on the lips. The way he sniffs the picture of the flower in his little book. The way he makes us stop to smell the real flowers. ​The time he started whining and I asked if he wanted a hug and he put his hands over his chest in a little hug sign. He keeps creating his own signs and it is the sweetest! The way he walked over to a tiny newborn at storytime to gently stroke her little head. The way he blows a kiss and then kisses me on the lips when I read a page in one of his favorite books that says "Blow the tree a tiny kiss." The way he puts his hands under his chin, looks up at the sky and does his extra cheesy smile when he is being funny. The time he learned how to step on his little chair, climb onto his table and climb off and then did it about 20 times in a row. The time Mama came home from teaching a yoga workshop and was holding Jude and we were saying bye to Daddy so he could go to work and Jude reached for Daddy, gave him a huge hug, and waved bye to Mama instead. The happy look on his face when he was playing with the balls, ramps and pulleys at the museum at Thanksgiving Point. The way he walked all over the museum, waving to all the fossils and grabbing all the signs. 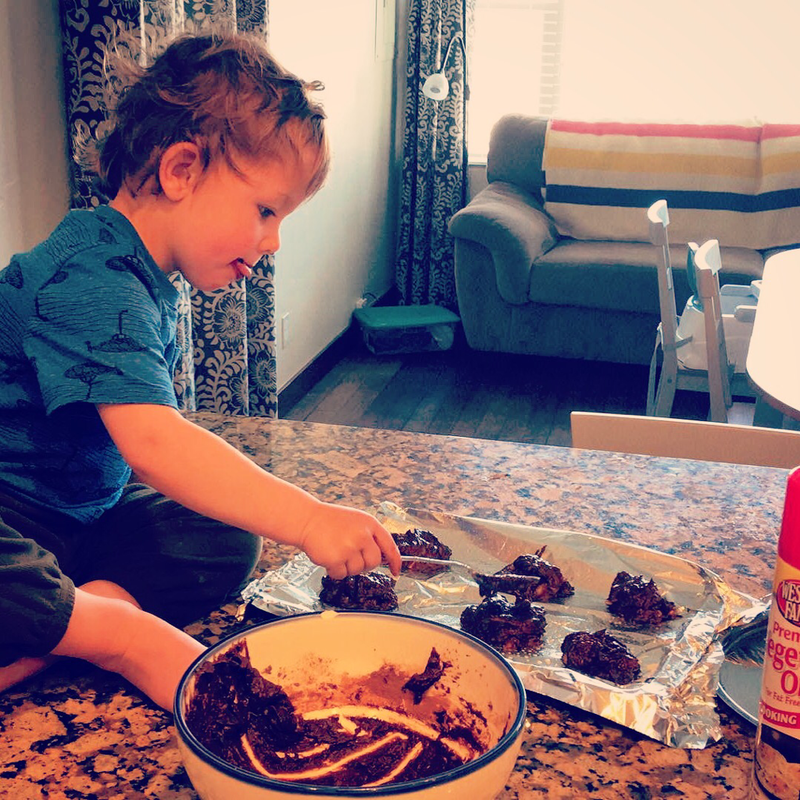 The time he was helping Mama bake banana bread and he kept sticking his fingers in the batter and giving me a sneaky grin and then taking bites (don't worry, no eggs!). 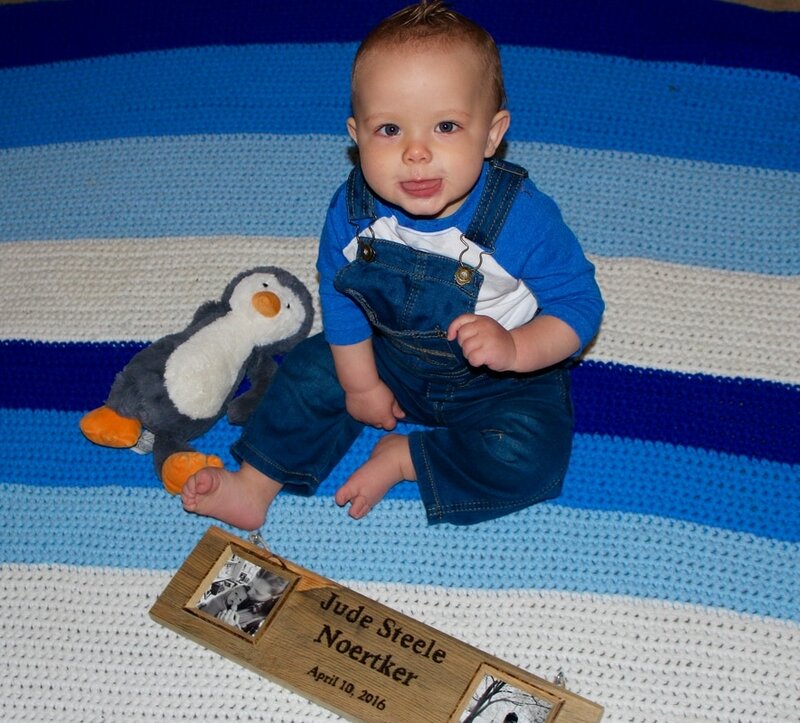 Mr. Juderbug Steele Noertker is a full blown toddler, both in personality and in the fact that he has started toddling around. 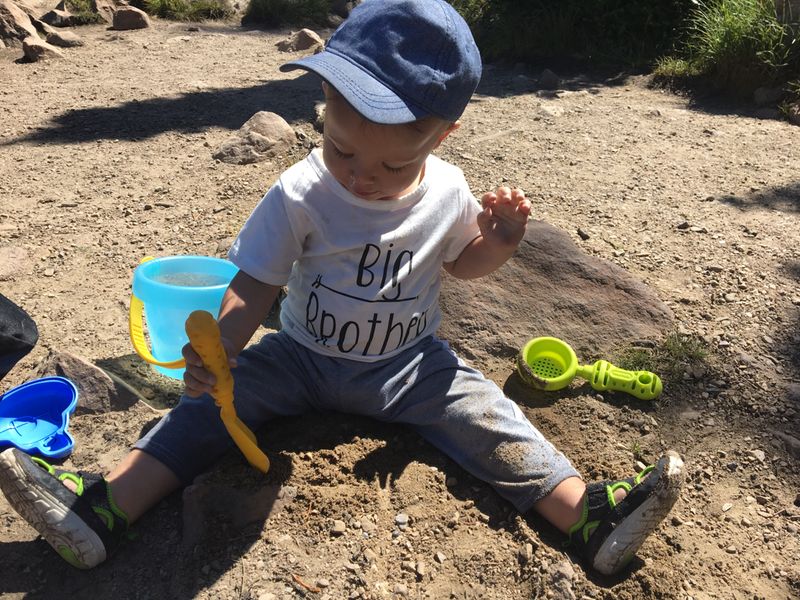 He is busy, curious and into everything, has a one-track mind, especially when it comes to his friend's sippy cups, and has the best sense of humor. 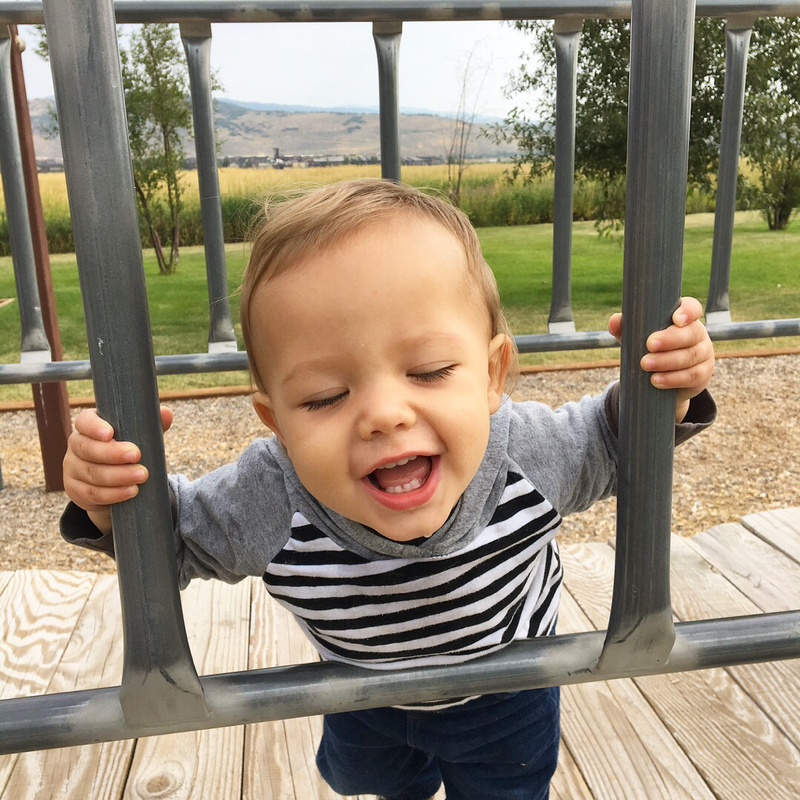 He loves playing outside and is determined to climb everything at the playground even though he can't even fully walk yet. He befriends all people and animals and absolutely adores dogs. He is communicating more and more with both signs and words and he understands everything we say. We love you Mr. Bug! Health: Excellent health this month! Sleep: Still on two naps a day, usually at 10 am and 3 pm. Goes to bed at 7:30, usually waking once in the night but sometimes sleeping through. He has started waking up earlier this month, probably because of the sun, and has been waking up at 6 am (even 5 am...too early). Diet: Still nurses about 4 times a day. Still eats and loves everything. Favorites include: avocado, raspberries, beans, grilled cheese, sweet potato canneloni, short ribs, fish (especially cod! ), eggs, vanilla ice cream, and the Hack Attack from No Worries. His record for steps is ten in a row! He is walking more and more every day. He can walk really well holding a hand. He can go down a slide by himself on his tummy. He can point to his head, hair, teeth, mouth, toes and belly button when asked. He can squeeze his apple sauce packets and eat a lara bar without assistance. He is starting to be able to use a fork. He has started stacking books and blocks. He can use a sand shovel. 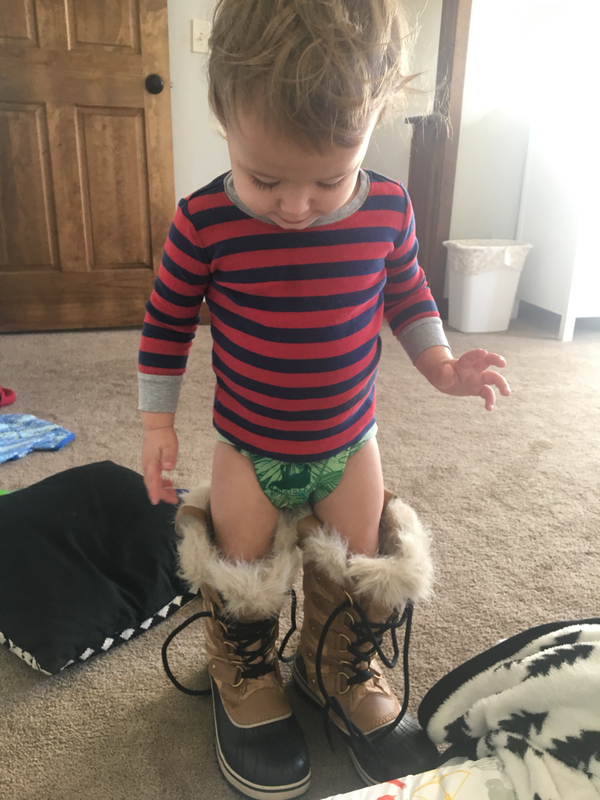 He can stand while I get him dressed and undressed. How excited he got when he met Toffee, my mom's cat for the first time. He chased her around shrieking with delight, played hide and seek with her and was so soft and gentle when he pet her. Almost makes me want to get a cat. The way he slow motion pokes a toy/fork/stick/etc. into his tummy while making a "cccchhhhhh" sound effect, all with the most focused look of concentration. The way he points to his teeth any time someone comments on how many teeth he has or says the word teeth. The time Miss Katrina at the library commented on his teeth and he pointed at his one teeth, pointed at her teeth and then laughed and gave me a hug, over and over and over. The way he kicks and smiles and screeches happily when he sees his friend Otto. The way he tried to get Otto to give him the toy he wanted by giving him every other toy within reach. He has started to understand the idea of trading. The HUGE grin on his face when Daddy got into the car when we picked him up from the airport after being in Europe for ten days. The time he gave his Tutu big hugs at the tulip festival. The time the library therapy dog licked his face and he bounced up and down and shrieked happily. The time he saw a little boy at the library and crawled over to him super fast, stopped right in front of him, sat up and waved as hard as he can. He really wanted to be friends with this kid! Luckily the little boy (probably 4 or 5 years old) stopped and waved and said hi and started playing with Jude. Jude was so happy. The time Jude was whining in the morning and Mama and Daddy were talking about how it would be nice if he could use some words and he just looked at us and signed "more" like he was showing us that he does know words. The time Jude was crawling around on the bed and kept flopping down face first, staying very still and quiet for about 10 seconds and then would start cracking up and do it all over again. The time Jude kept trying to feed Ellie, Brett's dog, dandelions at the park. The way Jude kept trying to kiss Ellie and she got scared! ​The time he started blowing raspberries on Brooke's leg at the park and Bindi walked over and sat right in her mom's lap to get him to stop. The way he put his little friend Liam's hat back on his head and then on his own head (on top of his own hat). The way he tried to help Bindi get up on the slide. The way he and Liam passed their two sippy cups back and forth for at least five minutes straight. The way he has started playing and sharing with his little friends. 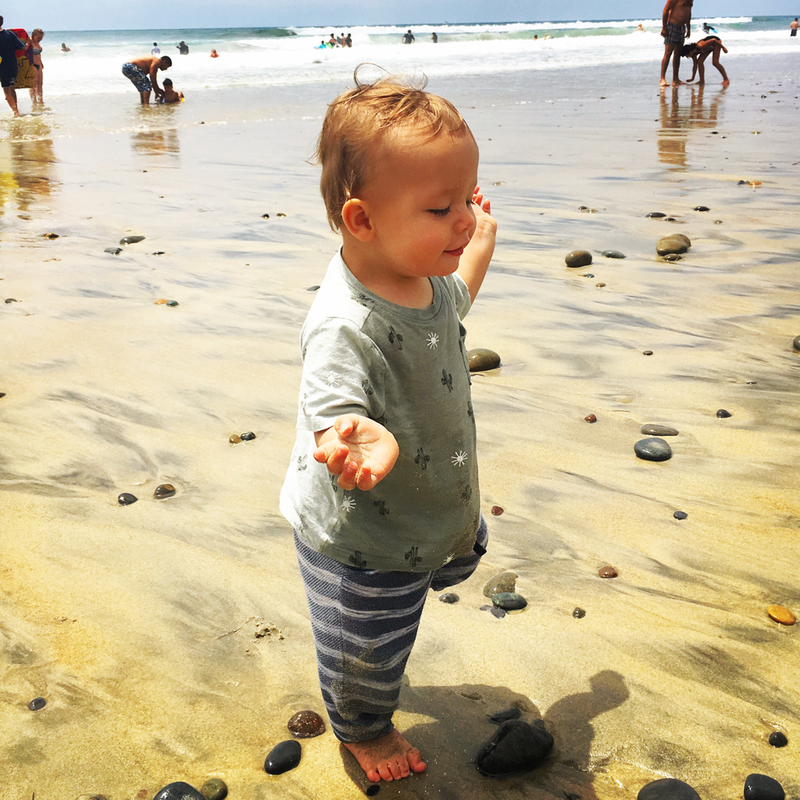 He gently touches their faces, shares his food, shares toys, waves and smiles (but steals sippy cups!). The time Jude, Bindi and Liam sat on the piano at Miner's Hospital together and played piano together. The time Jude showed off his walking skills to his great-grandparents. The way he practices "running" while holding Daddy's hands. The way he gives Daddy hugs and kisses and tickles the back of his neck when he is on his back in the ergo. The way he kicks his legs and sings in the backpack and ergo. The way he says "Mom Mom." The way he opens the pantry, grabs a snack and asks us to open it for him. The way he puts lara bars back in the bar container in the pantry if he only eats half. ​They way he says "woov" whenever he sees a dog. 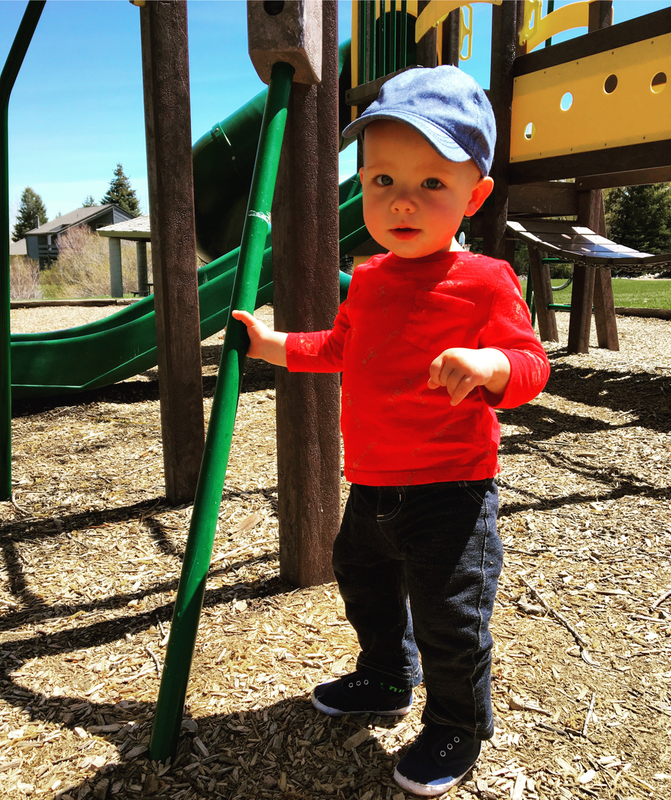 The way he points to the playground and kicks his legs when we get to the park. He insists we go to the slide first. The way he points to the slide to be lifted to the top and then points at the top of the slide and squeals to ask to do it again. The way he bites his lower lip, balls his hands up in fists and holds his hands up by his shoulders when he takes steps. So focused. Happy birthday Jude!! We can't believe you are already ONE. Every month I think "this is the best age" and that's exactly how I feel about having a one year old. He is curious and playful and has a great sense of humor. He shows off new talents and skills every day and amazes us with all that he has learned in just a year. P.S. I'm not going to stop with his monthly updates now that he is one. 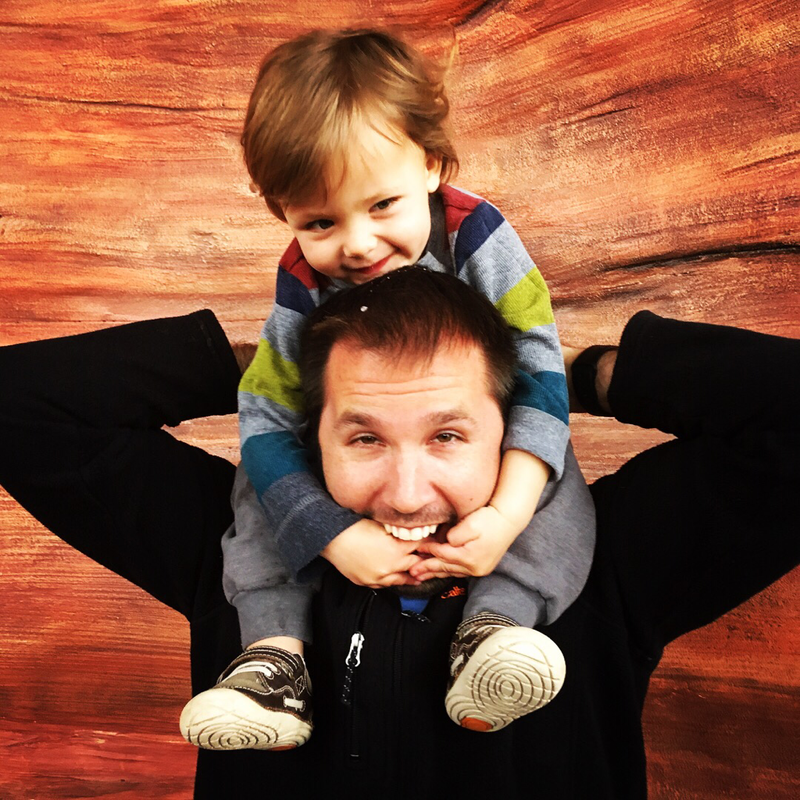 I love sharing what he is doing with our family and friends, especially those that don't live in Utah! 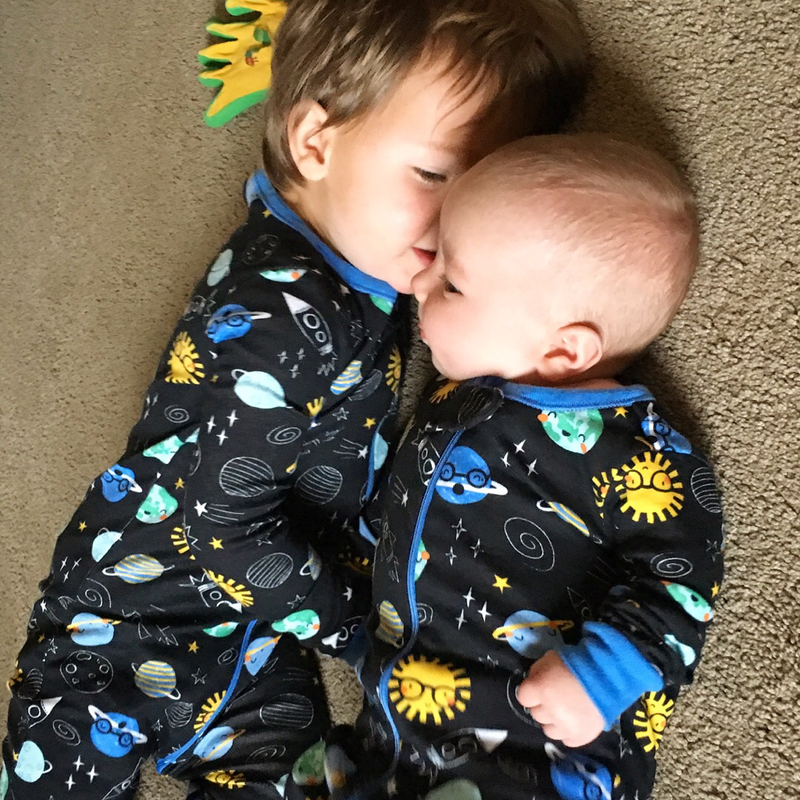 Clothes Size: Mostly 12-18 months, some 12 month pajamas still fit. 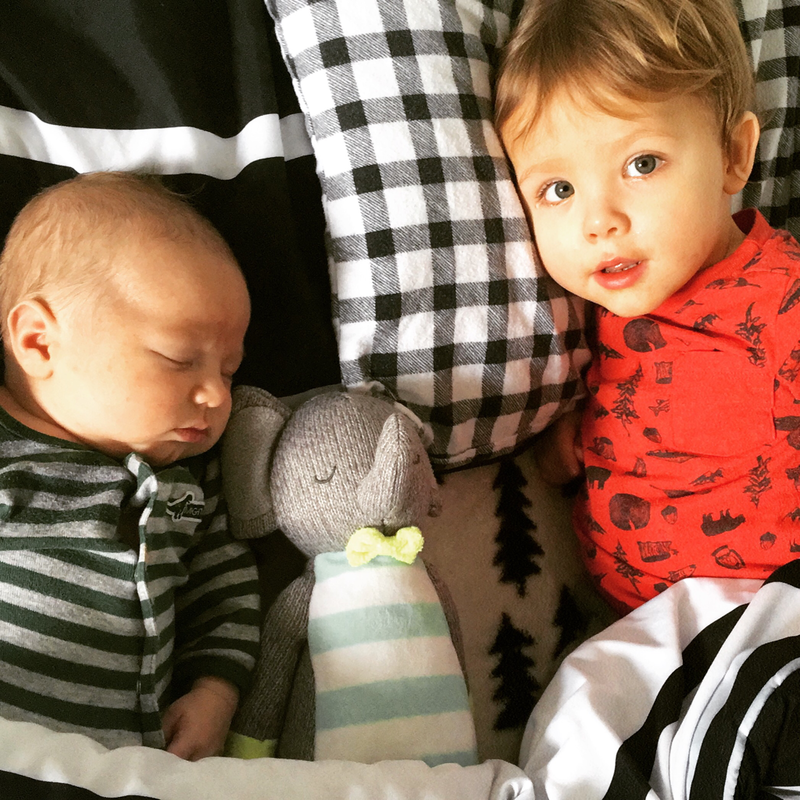 Health: Jude had a fever, cough and runny nose earlier this month at the same time he was teething. It was a challenging week to say the least! He is better now, though. 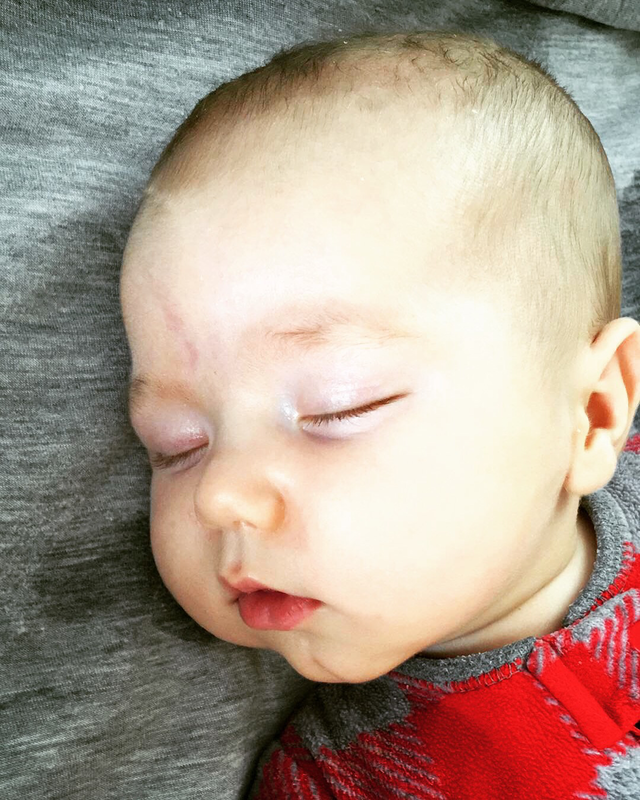 Sleep: Sickness and teething have not helped in the sleep department. 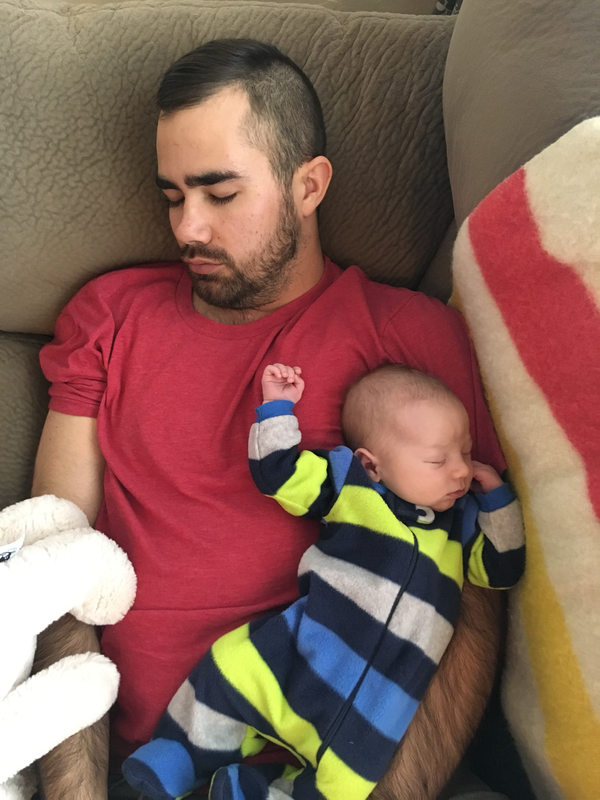 We have had some difficult nights and he even had a day where he took six naps like a tiny newborn! Mostly he naps 10-12 and 3-4 ish. Bedtime at 7:30, usually waking once early morning and then getting up at 7. 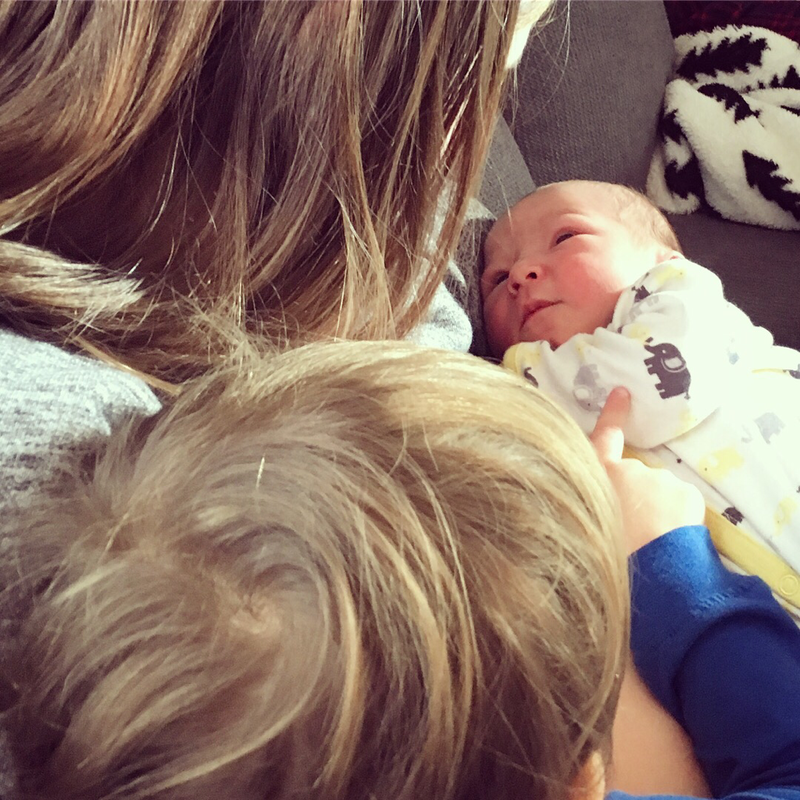 However, with teething and a fever there were some nights this month that it felt like he woke up every hour to nurse in the night! putting toys in and taking toys out of boxes, baskets, etc. his favorite book right now is What Do You Do With a Tail Like This? He has started letting go (of the table, wall, etc.) to practice standing on his own. He has started walking while holding our fingers. He has started placing his sippy cup back on his tray instead of chucking it over his shoulder. He has started sharing his toys and food with Mama, Daddy, friends and strangers. He has started creating little "games" like putting a ball in a box, closing the lid, opening the lid, taking the ball out and repeating. He has started putting things away: putting toys back in baskets and books back on shelves. His fourth top tooth is still coming in and a third bottom tooth is making its way through! Seven teeth now! He has started copying Mama when I'm doing yoga with him...mostly child's pose and sitting cross legged while facing me! He has started using a fork. He has started repeating some words when we say them. The time he blew raspberries on Auntie Lauren's tummy. The way he puts his head down when he crawls really fast. The time he laughed so hard every time I said "Buzz" when I was reading Mr. Brown Can Moo! Can You? The morning I got up early to go to the bathroom and I heard little crawling slaps on the bathroom floor because Jude had crawled out of bed and followed me. The way he crawls over Mama in the morning to grab Daddy's face and give him nuzzles. The way he "reads" books in the car, slowly turning the pages. The time he waved, pointed to, high fived and laughed at his reflection in the dressing room mirror. The time he gave Otto kisses on the nose while we were getting the babies dressed after swimming. The time he raised his arms in the air and cheered when Daddy kissed Mama while cooking dinner. The way he crawls over to me just to give me a kiss in the middle of playing with his toys. ​The way he kisses his stuffed animals on the mouth. The time I brought Jude to PEEK with me to teach yoga and one of the preschoolers suggested we do the bunny breath where we breathe in with little "bunny sniffs" and Jude started making a little sniffing breath noise. My yoga students thought it was so funny! 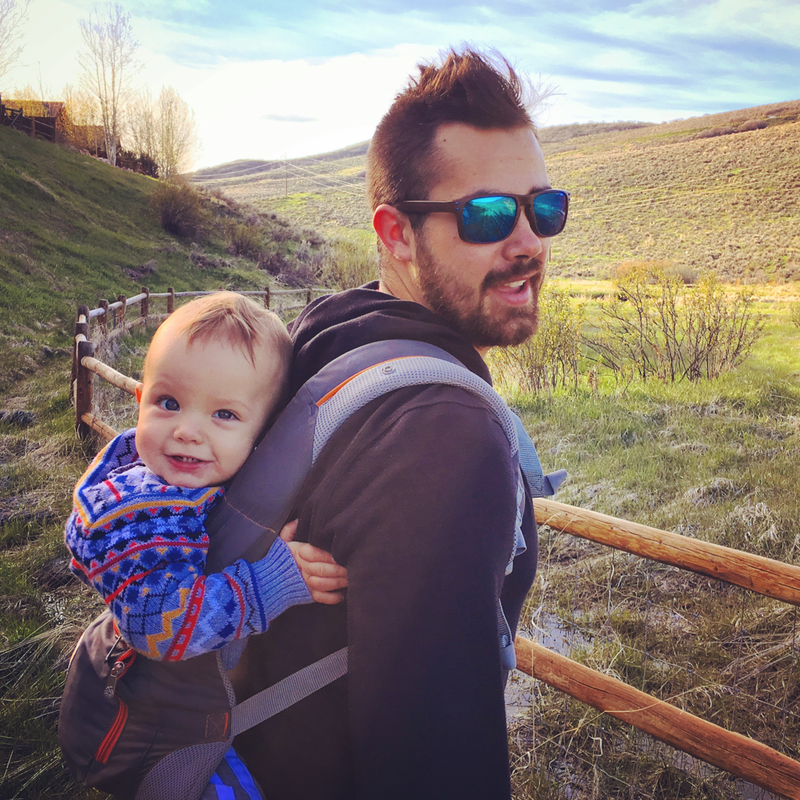 ​The time we were waiting to be seated at Wasatch Brew Pub and as a lady was leaving the restaurant she said hi to Jude and tickled his feet and he leaned towards her to give her a hug and have her hold him. It made her day! The smile on his face when he got to crawl around on a trampoline for the first time. The way he always pulls out his musical instruments to play with first. The way he holds onto my shoulder and gives me kisses when I practice cat/cow. The time Mama and Daddy were discussing if we should start teaching Jude sign language when we were at dinner at Red Rock and decided to try showing him "more" and he immediately started signing "more" when he wanted more food. The time we were playing in his room and he signed "more" and crawled into the kitchen because he was ready for lunch. When we were at the Museum of Natural Curiosity and playing in the little baby playground and he crawled over to a smaller baby who couldn't crawl yet and gave her a toy radish to play with. The time Jude, Mama and Daddy were playing in Jude's room and he would share his ball with one of us and smile when we took it, then hold his hand out to take it back and share it with the other parent. He loves sharing these days! The way he yells and runs around the room in circles when we let him have naked time. The way he yells (sings?) while smacking the guitar. The way he crawls so fast to Daddy so he can wrestle him. The way he waves to the birds at our bird feeder every morning. 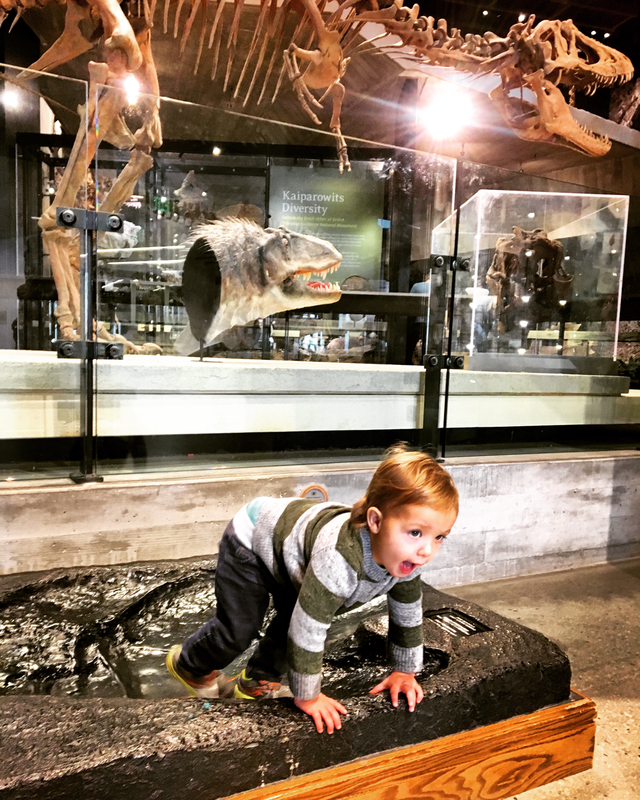 ​The time he started rubbing other moms' backs at the Museum of Natural Curiosity until they turned around to look at him and then he smiled and waved. The way he takes a pom pom out of the box, kisses it, holds it in front of Mama's mouth to have me kiss it and then puts it back in the box. The time he looked up at me mid-nurse, signed "more," smiled, and went back to nursing. 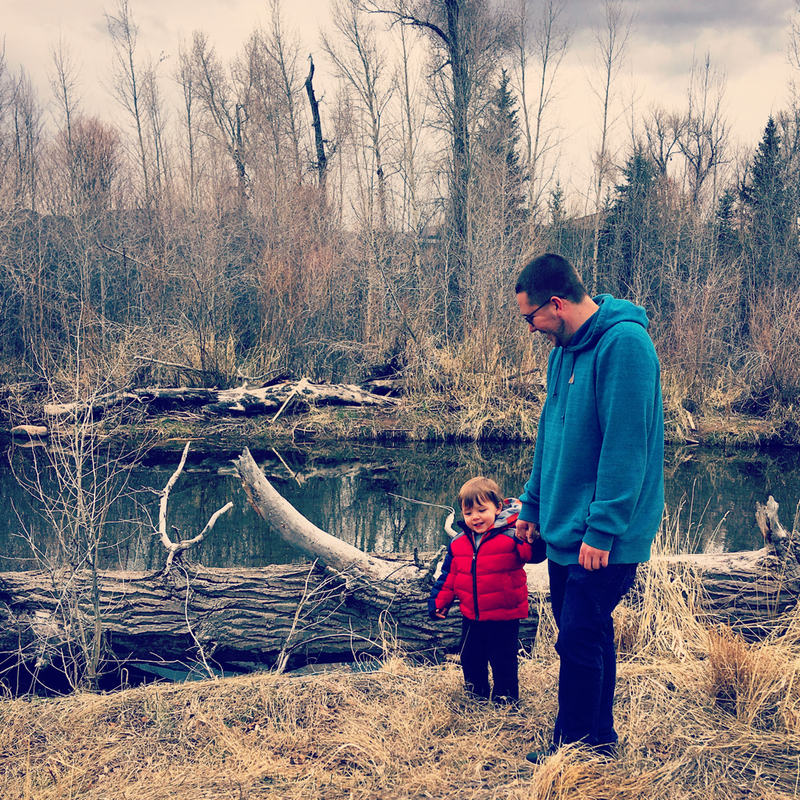 ​The time Daddy asked Jude if he wanted to go see the baby hawk that lives in the big tree behind Canyon Creek and Jude said "Bapf" so confidently that we decided that must be the baby hawk's name. The time we took Jude to Dolly's to pick out a book for his birthday and he picked out a little wooden robot toy instead. The time Daddy played us one of his songs and Jude was holding onto the coffee table and started really dancing for the first time! The way he points at everything when we go on bike rides. The way he shrieks with joy and starts waving like crazy when we are eating on our balcony and he sees one of our neighbors, especially if they have a dog. The time we were folding laundry when Daddy was in Austria and Jude grabbed one of Daddy's shirts and sang "Dada Dada" while hugging the shirt. The way he gives big hugs when we pick him up out of his crib. Baby Jude is becoming more and more Toddler Jude by the minute. He is determined, opinionated, affectionate, and social. 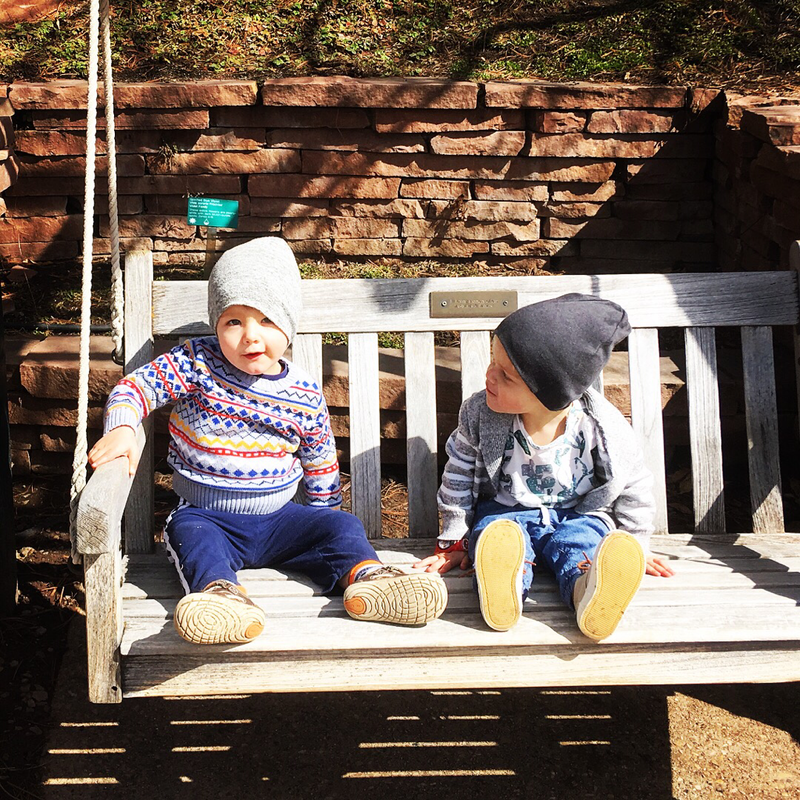 He loves playing with little friends, is increasingly interested in the world around him, and loves to make us laugh. He is also testing limits and has moments of extreme clinginess. He is talks and sings all the time and is working hard to start walking soon. He even took his first step this month! We love you more than ever, bug! Clothes Size: Some 12 month, mostly 12-18 month. Somehow a size 18-24 month sweater fits him at the same time a 3-6 month swimsuit does. Sizing is weird. Health: A tiny cold this month. Runny nose and a little cough but not much else. Mostly he is a healthy little guy! Diet: Nurses 4-5 times a day (morning, before naps, before bed, sometimes in the night). Eats everything. Favorites include spaghetti squash, pizza, avocado toast, graham crackers, gold fish, puffs, strawberries, apples, frittatas... He loves everything. when we try to hold onto his hands to help him walk. He wants to do it himself. He has almost four top teeth now (two bottom). The fourth top tooth is s l o w l y popping through. 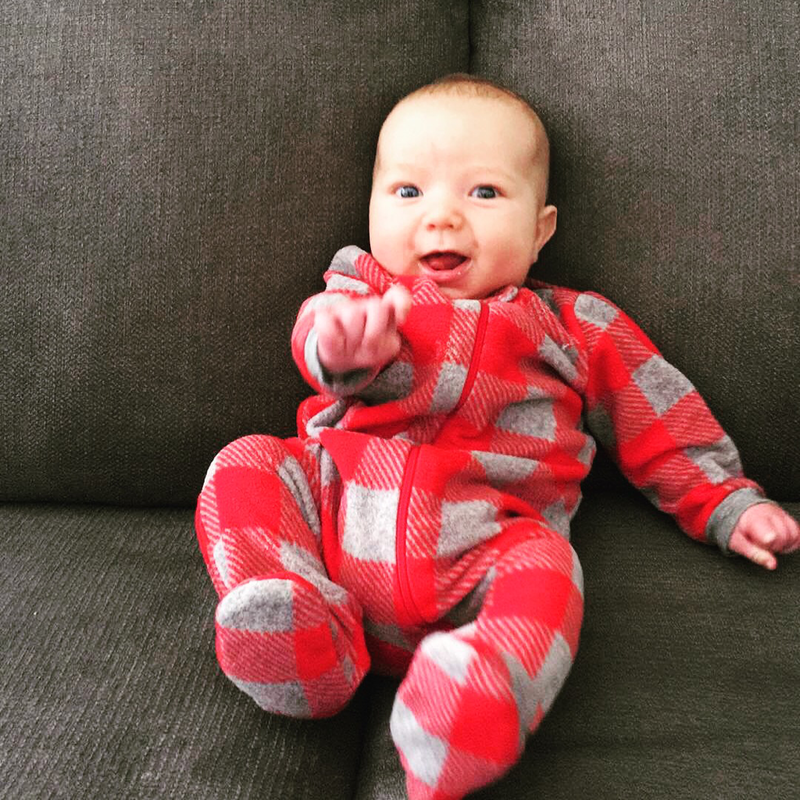 He has started pointing at everything. He has started putting objects inside of containers (balls in bottle, toys in basket, etc.) Before now he never wanted to let go of things! He had his first tiny toddler tantrum when I wouldn't let him wave the car keys around and risk hitting other babies at story time. He can crawl up stairs really well and really quickly. He still needs a spotter because he doesn't know how to go down though! He put his sippy cup back on his tray instead of throwing it on the floor. It's only happened a couple times but it's something. The day at story time that he tried to hug other babies, crawled over a mom's legs, tried to drink another baby's bottle, attempted to put on a baby girl's snow suit and sat in Miss Katrina's lap for several songs. He is more social and outgoing every day! The time we were eating a bagel in PCBB and he waved and smiled at everybody. The time he was practicing climbing the stairs with Daddy's help and would get to the top and crawl under my legs, turn around and pretty much jump into Daddy's arms off the stairs. We're working on going DOWN the stairs. The time he kept pulling himself up to stand on the chair in his room and then practice balancing/controlled falling over and over again. ​The time we were playing with Otto at the play cafe... Jude was standing on the outside of the ball pit and Otto was inside the ball pit and Otto leaned over to grab Jude's face and give him a kiss. Then they looked at each other and smiled and waved. The time Jude chased McKai to get his quesadilla and McKai ran away and then decided to share with Jude and fed the quesadilla to him. The time Jude kept dropping the sippy cup to make Norah laugh and pick it up from him. 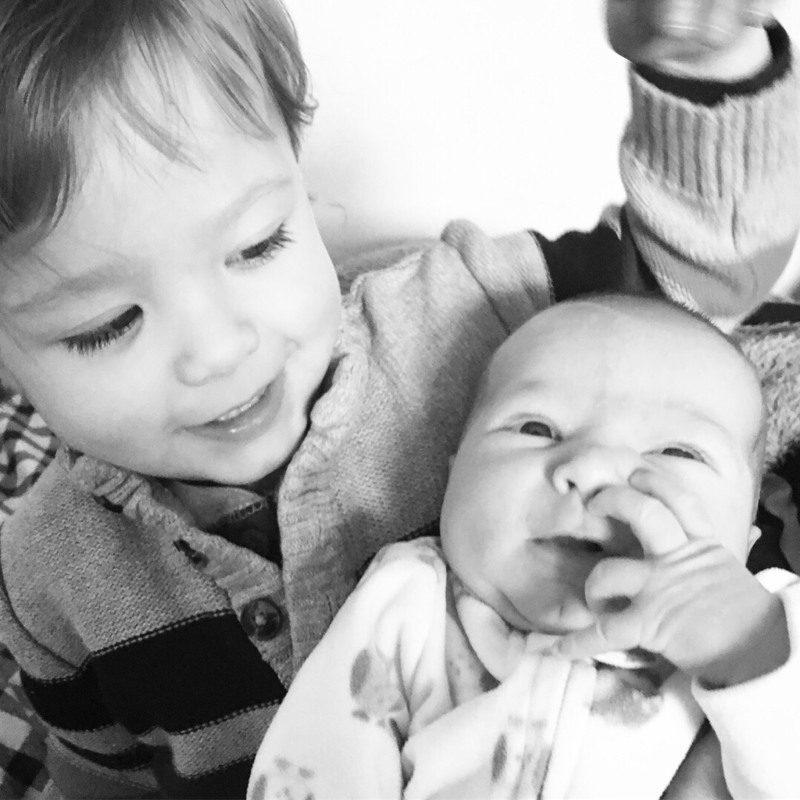 The time he would growl and laugh at dinner and then Norah would copy him and they kept going back and forth, just growling and giggling at each other. The time Norah gave Jude a big hug and a kiss to say good bye and he hugged her back. The time I put his stuffed animals in the window sill and he stood up and scooted along, pushing his animals off as he scooted. The time we took him climbing for the first time and he grabbed the holds and then instinctively looked for places to put his feet! The way he crawled over to get me when I was done climbing a route at the climbing gym...so happy and fast! The way he turns around to try to face forward in the shopping cart and casually drapes one arm over the back of the seat. The way he says "Hi Dada" and Daddy says "Hi Jude Jude." 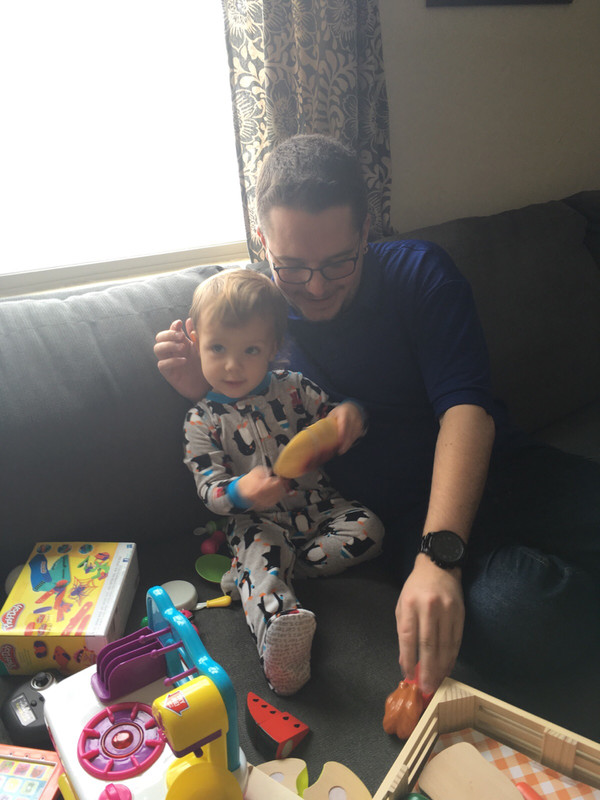 ​The time his hands were covered in banana and avocado and he grabbed his hair and pulled it so it was sticking straight up and he started cracking up. The time he pretended that he was going to share his coaster with our server at Red Rock. The time he first noticed the animals at the zoo and waved to all of them. The time we were at the pool with Otto and there were tons of kids there for a camp and he blew bubbles and smiled at all the kids and waved at the life guard. 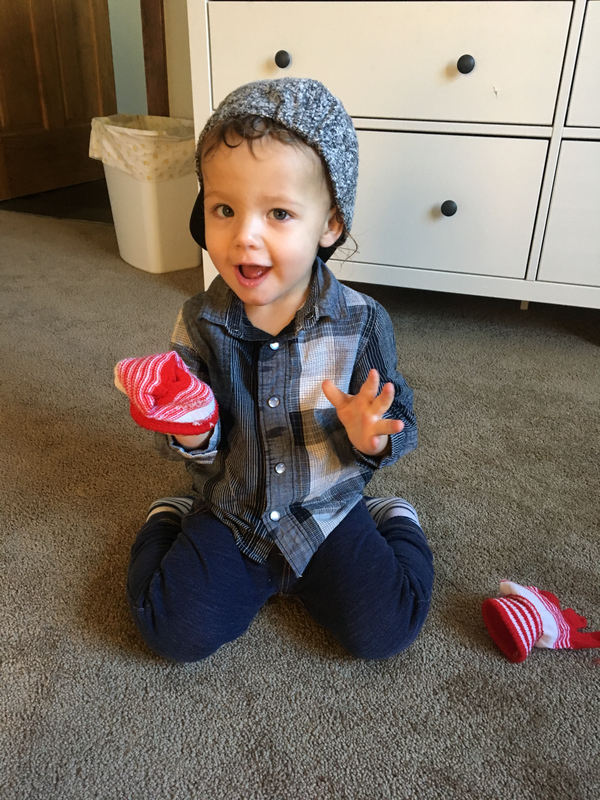 ​The time Jude crawled out of his room, through the living room, up the stairs, through our room, into the bathroom and stood at the edge of the tub because he wanted to take a bath. He knows what he wants! The time he said something that sounded an awful lot like "I love you, Mama." The way he reaches to give Daddy hugs when he leaves for work. ​The time I pointed to my nose and then asked "Where's Jude's nose?" and he pointed to his own nose! The "lizard crawl" (very fast and excited crawling). The way he pretends he wants us to feed him with a spoon and then close his lips at the last minute and gives a little smirk. 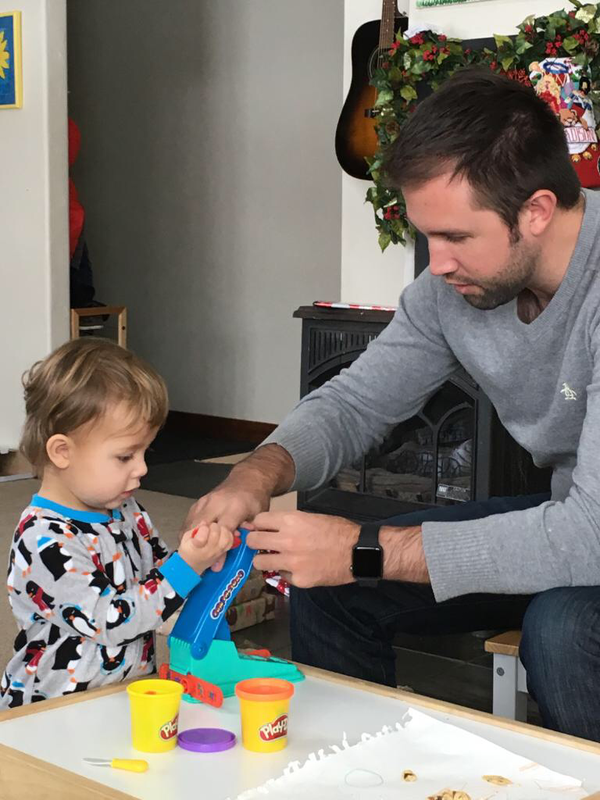 The time Daddy gave him a carrot to gnaw on for his teething pain and he thought it was the best thing in the world. The way he has started sharing his toys. The way he shares his pacifiers and tries to put them in Mommy's and Daddy's mouths. The time Bindi came over for a play date and once they warmed up they pulled books off the shelf together, chased Bindi's mama, played music together, tried to use each other's heads as drums and had long conversations including squawks, shrieks, bouncing and pointing. 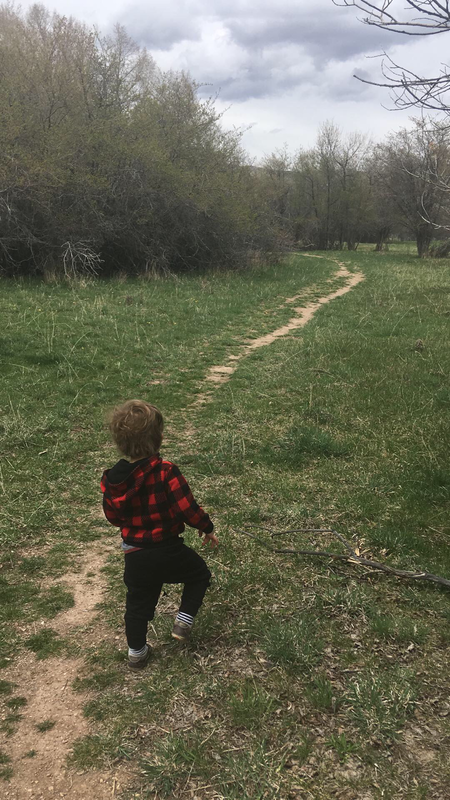 The time we got to our campsite in Zion and he started crawling around and exploring in the dirt, trying to climb rocks, picking up sticks and leaves and "sharing" the leaves with the tree stump. 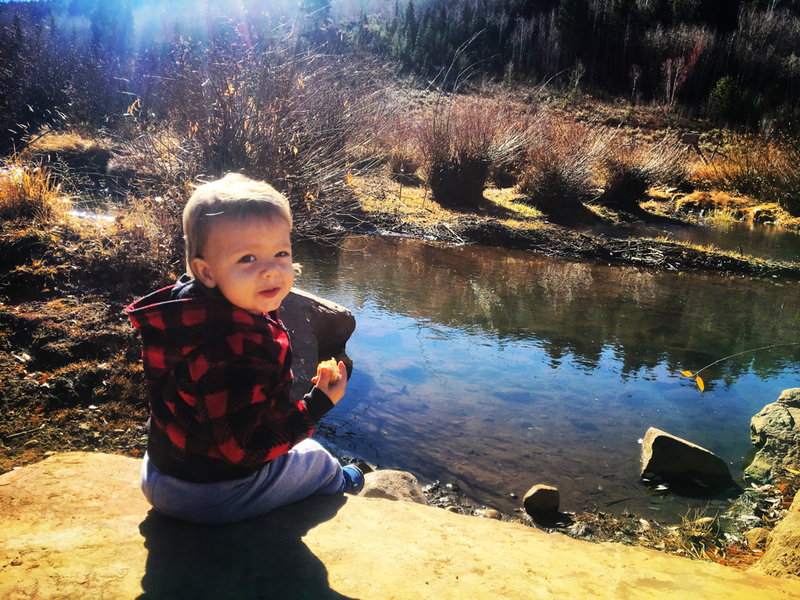 The time he was eating an apple in Zion and kept dipping it in his pile of puffs before taking a bite. 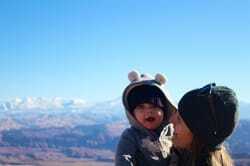 The time we were on the shuttle in Zion and other passengers were waving at him and he didn't wave until we took off his mittens and then he started waving like crazy with both hands. The way he sits up straight and looks around intently like a little meerkat when he hears Daddy opening the door to come home. The time he jumped out of my lap and crawled extra fast when he heard Daddy get home. The way he tries to grab Daddy's face when his hands are messy. The time he stood at the window and yelled "Dada" while waiting for Daddy to get home. The time he was trying to eat wood chips at Liberty Park so Mama swept them off the little table and then Otto found some wood chips and fed them to Jude. The look of pure bliss on his face when Daddy gave him his first bite of vanilla ice cream. Life with our little bug just keeps getting better and better. Every month he gets more playful, more social and shows more of his happy personality. He is affectionate and goofy, he loves to give hugs and kisses, and laughs at everything. He plays hide and seek and peek a boo, loves reading stories and playing musical instruments. He is more stubborn and independent every day and becoming more and more like a little toddler. We can't believe he will be one in only two months!! Clothes Size: Some 6-12 month, some 9-12 month and mostly growing into 12-18 months! Health: I totally jinxed it. 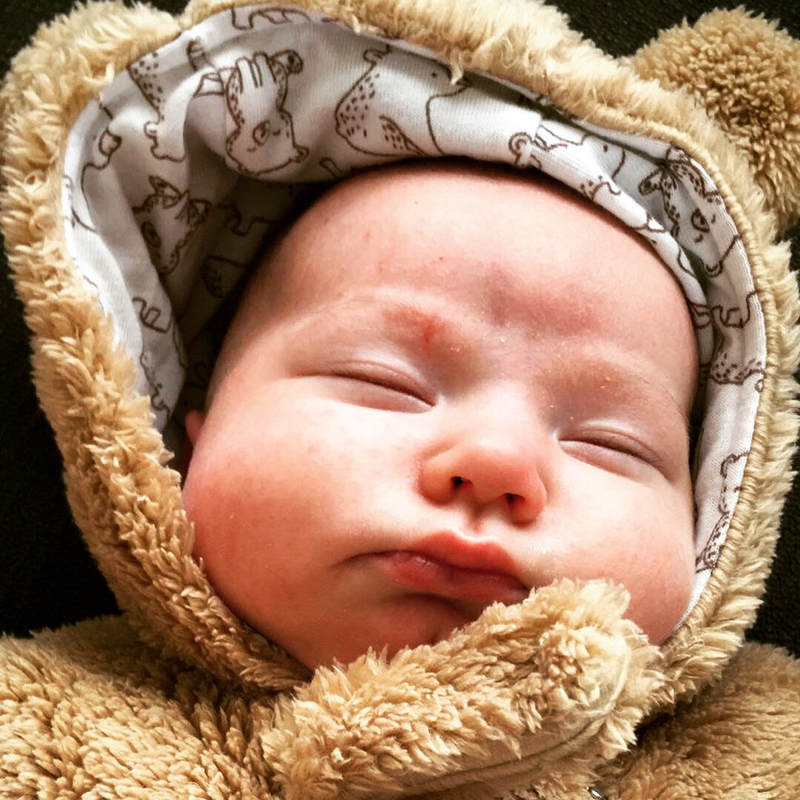 Jude got his first cold this last month and it lasted nearly 10 days! He was really sick for about three days and then just had a lingering runny nose for another week. Sleep: He is officially down to two naps a day and has more of a schedule than ever before. He typically wakes up around 7:30, naps from 10-12, naps again 3:30-5 and goes down at 7:30. He's such a good napper and mostly sleeps through the night but recently likes to wake up at 6 ish. Not sure if he is wanting to get up at this early time or just nurse and pull my hair. Diet: Nurses 4-5 times a day plus eats everything but nuts and honey! He loves avocado, pizza, burritos, vegan shepherd's pie, spaghetti squash with ground turkey and rose sauce, strawberries, bananas, muffins, eggs...Still have yet to find something he doesn't like to eat. He already knew how to wave but has really started waving goodbye when somebody says "bye"
He is getting his first two top teeth! Soon he will have a total of four teeth. The time he was sick and said "Mom. Mama." The time he kept kissing me on the tummy and blowing raspberries when I was trying to get him to take a nap with me. The way he "casts spells." The time he started giving me kisses on the cheek instead of napping. The time he crawled around the corner and said "Boo!" The way he sits and flaps his arms and kicks his legs and smiles when he is really happy. The time he clapped his hands when Daddy walked in the door. The time I got him from his nap when Daddy was home for lunch and I said "Do you know who is home?" and he said "Dada!" The time I was sitting in his room eating a slice of pizza and he raced over to me, put his hands on my knees to stand up and grinned, waiting for me to give him a bite. How excited he was when Otto came over one morning for a playdate. The time he and Otto held hands while playing together in his room. How excited he was when we got in the Ecker Hill pool for the first time. He hadn't gone swimming since he was about 4 months old and he loves it! Makes me so excited for summer. 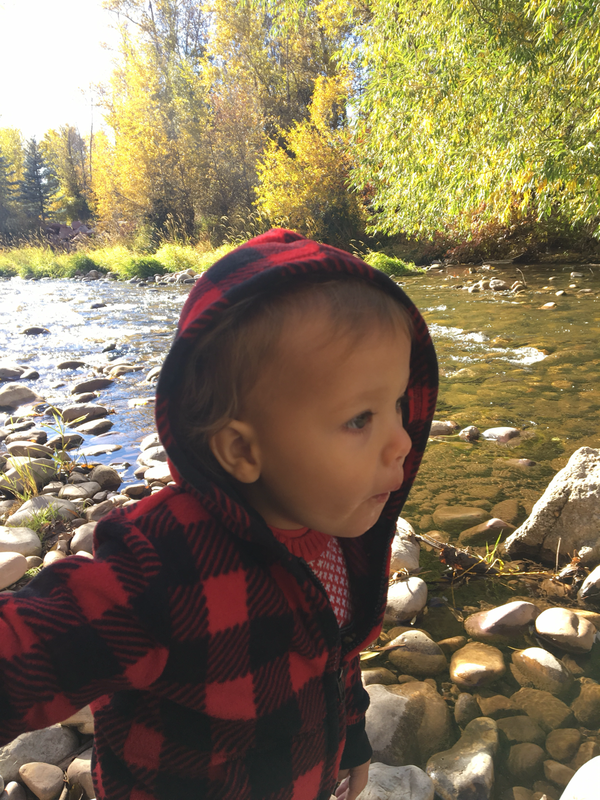 The time he noticed the stream for the first time when we were doing our regular McLeod Creek walk. He was mesmerized, looking at the stream, then smiling at me, then back at the stream. The way he kicks every time we get him out of his high chair or carseat. 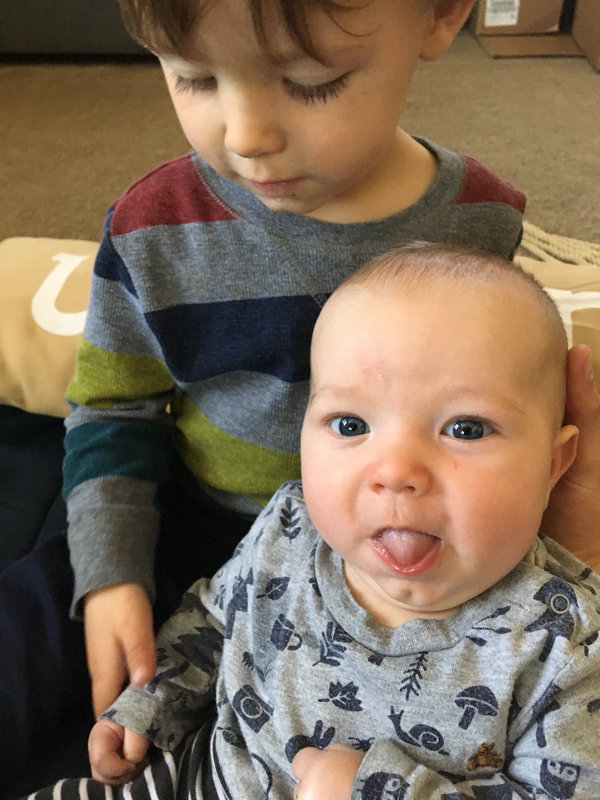 The time I was holding our friend Ren at storytime while Jude was playing with other babies and he turned around and got jealous and charged toward me yelling. The time Otto was sad and Jude patted him on the back. ​The time we were shopping at Trader Joe's and Jude kept giving me big hugs while sitting in the cart. The time I was teaching yoga at PEEK and he happily rang the cowbell and then climbed into my lap to hug me during our goodbye song. The way he waves goodbye to Daddy every morning when he leaves for work. The way he gives Daddy hugs when he gets home. The way he chases Daddy and laughs when they play hide and seek. The time he only wanted to hold onto the blue ball when we were playing with McKai at the children's museum. The way he leans back to go upside down when we are holding him. The way he sat right under a bench at Sugar House Park when we were playing with Otto. The way he crawls away from me to play with the other babies at storytime. So independent. The time he crawled over to Miss Katrina at storytime and shut her ukelele case and looked back at me and did the scrunch face. The way he kicks his legs in the swing. The time he used the little fossil brushes at the Natural History Museum as drumsticks. The time Otto sat next to him at the park and nuzzled his head into Jude's shoulder. The way he gives me kisses on the cheek and pretty much inhales my whole cheek. The way he climbs over me every morning to attack Daddy with loves and hugs. The time he tried to chew on preschooler's tutu skirt when I was teaching yoga at PEEK. The time he gently pointed to Bindi's headband instead of trying to grab her hair. The time he and Bindi were standing at the table in the library before storytime and were communicating by tapping on the table. They were copying each other and tapping in between and in rhythm. The time we were at Maxwell's and he was sitting in the booth with Uncle Brett and kept trying to get Brett to chew on the wax paper. The time he kept trying to get Auntie Erika to chew on the jingle bells. The way he just keeps playing happily with toys and Grandma Deb when we come back from skiing. He gives us this look like "oh, you're here? Well I'm having fun with Grandma." The way he plays his drum and cymbals in rhythm. Jude is definitely starting to creep into toddlerhood! He is mobile, social, and increasingly independent. He already wants to do things himself, like feeding himself and "reading" (closing and then chewing) his books. He has started to develop a sense of humor and teases us by pretending to feed us and then eating it himself. He laughs, squeals and claps all the time. This is the best stage so far! Health: Excellent health! I don't want to jinx it but he still has yet to get sick. 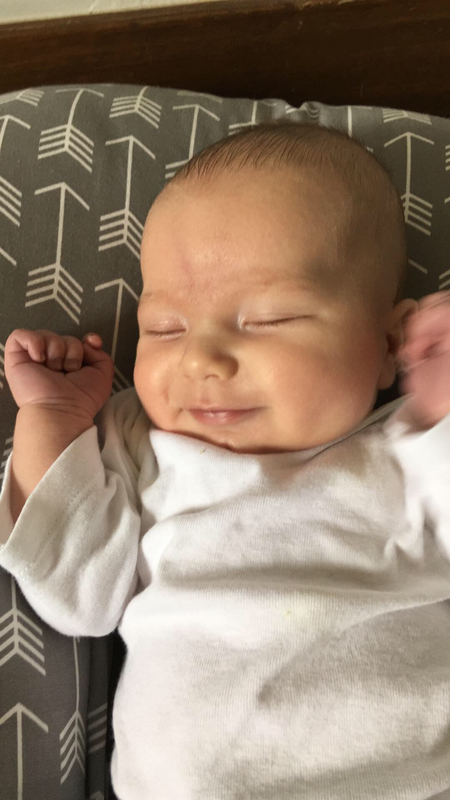 Sleep: Jude is starting to transition from 3 naps per day to 2 naps per day. Some days he takes 3 naps, some days he takes 2. Mostly he goes down easily for naps and sleeps for 1.5-2.5 hours. He sleeps through the night sometimes but hasn't slept through the night the last few weeks. 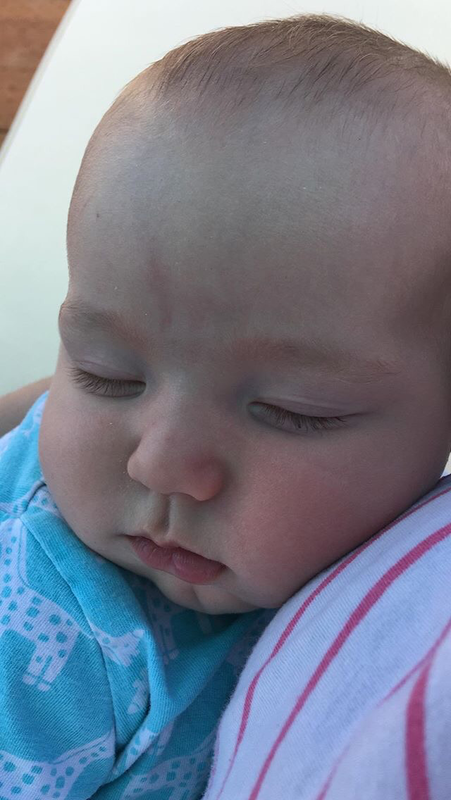 He has had a little trouble going down for the night recently (around 7) and has gotten into the habit of waking up sometime between 8 and 10 wanting to be held to go back to sleep so we are working on that. Diet: We have yet to find something this kid doesn't like to eat! This month we have started giving him more bites of what we are eating. He eats all sorts of fruits and vegetables, oatmeal, chicken, yogurt, eggs, pasta, rice, burritos, etc. He loves feeding himself! He started crawling on December 15! He can grab his sippy cup and drink from it himself. Daddy taught him how! He first pulled himself up to stand on January 2. He said "hi" for the first time at a friend's dinner party when we were introducing him to someone new, and then said it again meeting someone else a few minutes later! When we were lying in bed in our hotel in Moab and he crawled over to me and blew a raspberry on my tummy​. The way he waved the wrapping paper in the air on Christmas. The time I was building a block tower and Jude was clapping two blocks together and then gave me this little smirk while he dropped a block on my tower, causing it to topple over. The way he puts his arms above his head and sways side to side in his high chair. The way he kicks his legs excitedly every time we pick him up. The time he smeared banana in his hair and gave himself a little mohawk hairdo. The way he warmed up to Uncle Kevin after Uncle Kevin read him one of his favorite books. The way he grabs his block train and always takes off the same blue block to chew on. The way he holds his alphabet magnets in his mouth and crawls around. The time Daddy threw the ball into the bin and made it hit the top of the bin and then Jude grabbed the ball and copied him by throwing it against the top. The way he shakes his indestrucibles book. The way he sticks his finger in the chomping dino mouth in his Dino Chomp book. 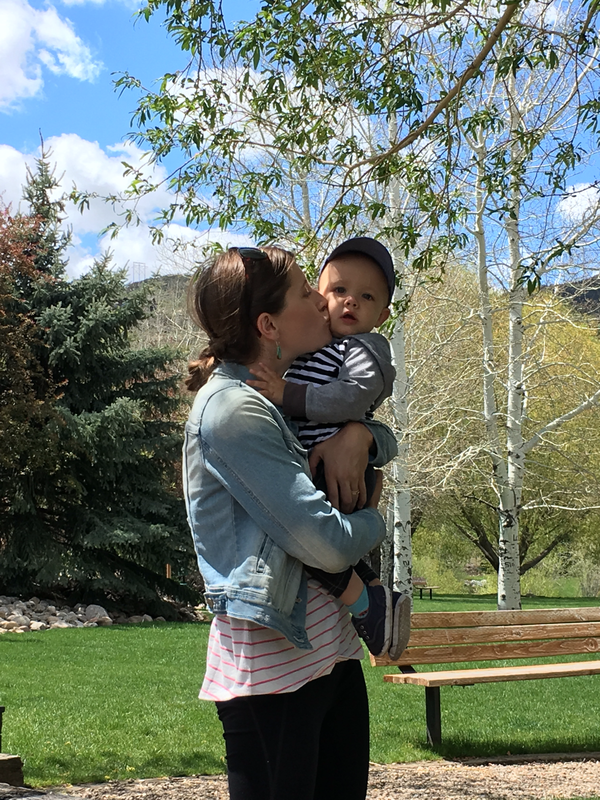 The time we were at dinner in Moab and he was a little fussy so I was singing the "Open, Shut Them" song with him and he clapped at the "clap, clap, clap" part. 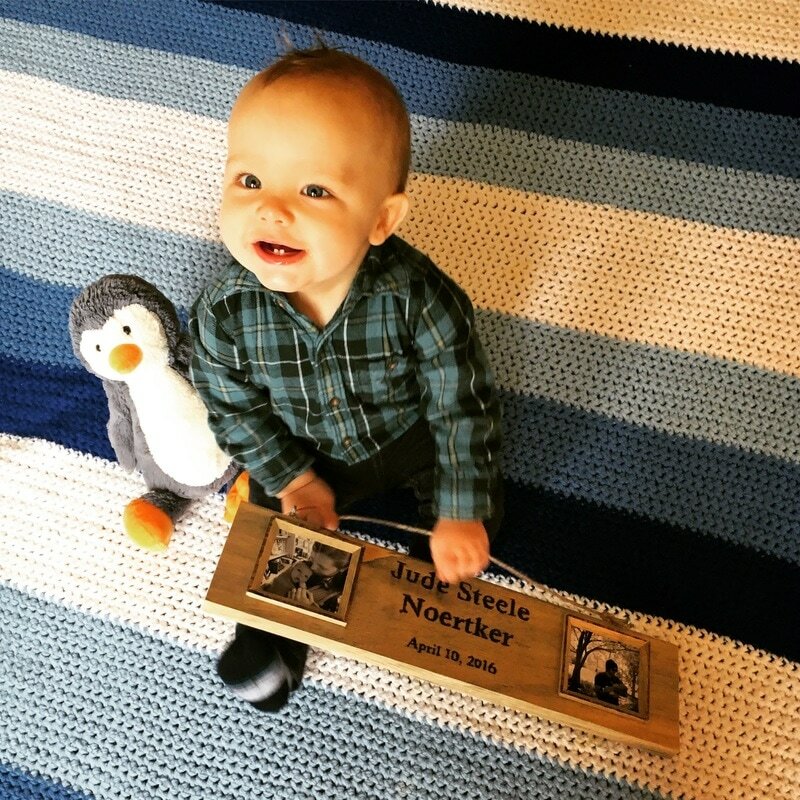 ​The way he laughs when Daddy nudges him with a yoga block. His proud face when he crawled from his room all the way into the kitchen for the first time. 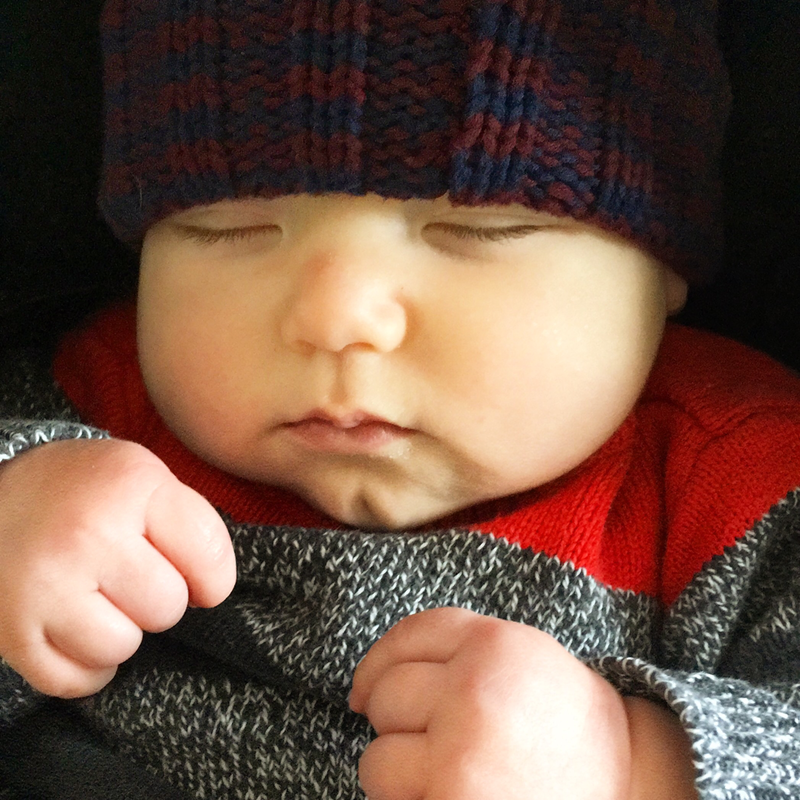 ​The way he pulls off his socks and grabs and kicks his feet in his car seat. The time he crawled to the middle of the room during storytime and then kicked his feet like crazy when Miss Katrina picked him up. 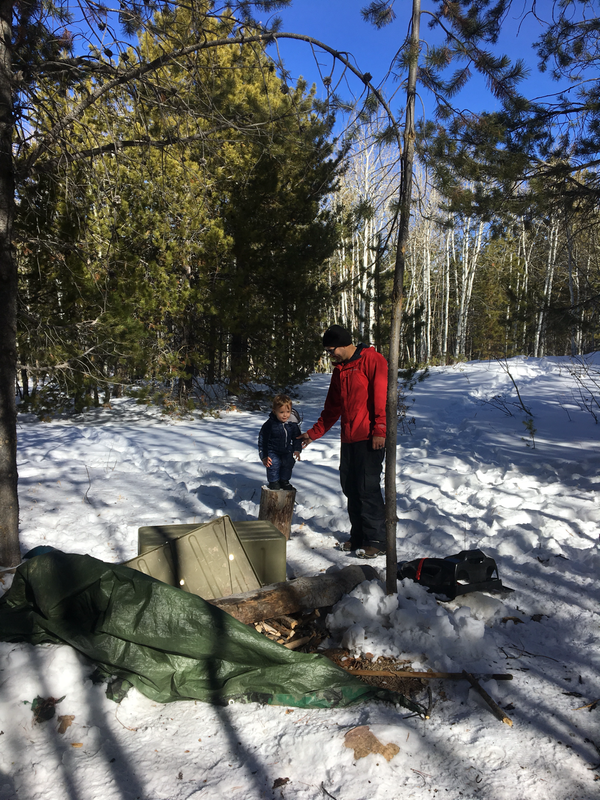 The time he started whining a little in the backpack on our Shingle Creek hike and we took him out and he just wanted to play in the snow. He was so happy to sit in the snow! The way he pretends he is going to feed Daddy a puff and then laughs and eats it himself. The time he was in the bath and took a few deep breaths in to prepare to do his pterodactyl yell. The way he always has his pointer finger in his mouth and laughs when we copy him. ​The time Daddy told him not to scream in his high chair and he made a fake pouty face and then laughed when we called him out on it. The time Daddy was playing guitar and Mommy was playing the little drum and Jude started playing his cymbals IN RHYTHM and when he got off he stopped, listened and started to play in rhythm again. This was an especially proud dad moment. The way he flaps his arms and kicks his feet at the same time when he is really excited. The time Daddy blew a raspberry on my tummy and Jude copied. The way he gives the biggest kisses a million times a day. The way he is so independent and social at storytime and crawls over to other babies to befriend them. The way he squeals and kicks when one of us is carrying him and the other parent is walking behind looking at him. He gets so excited! The time Daddy got up early with him and let Mama sleep in and when Daddy came out of the bathroom Jude was just sitting there holding The Very Hungry Catepillar​, waiting for Daddy to read it to him.